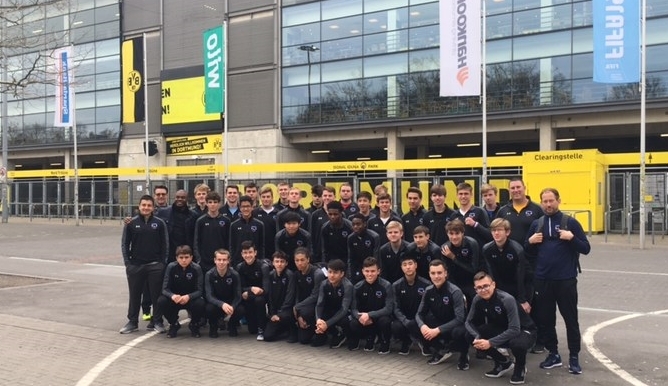 The Kentucky 2019 ODP International Trip is in Germany this week! 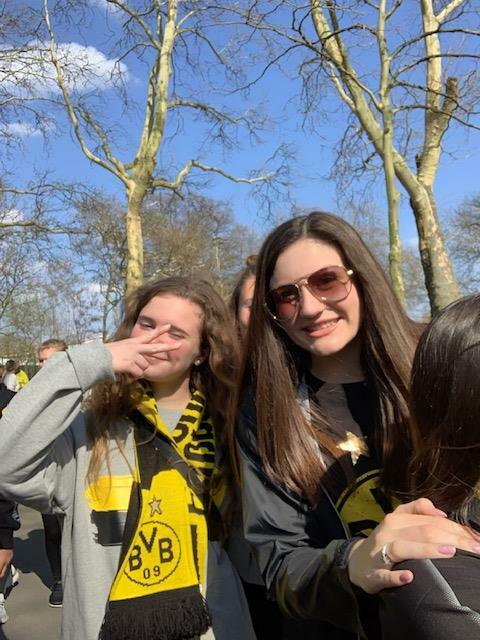 We will be posting summaries of each day so please come back and check out how we are spending our time in Dortmund! 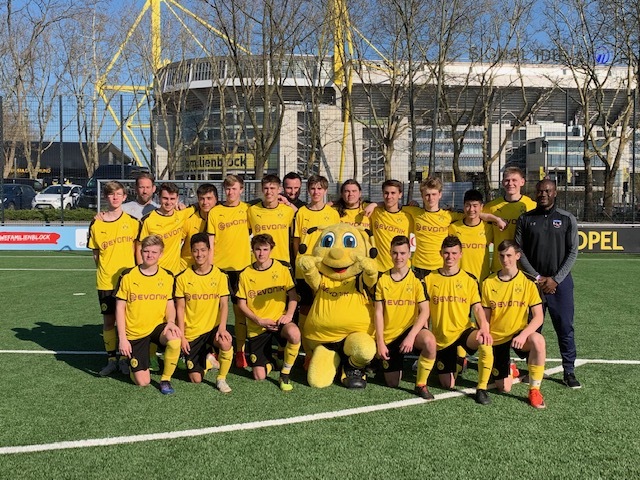 March 27-28, 2019 - Kentucky ODP to Louisville (Boys)/Paris (Girls) to Dusseldorf then on to Dortmund! 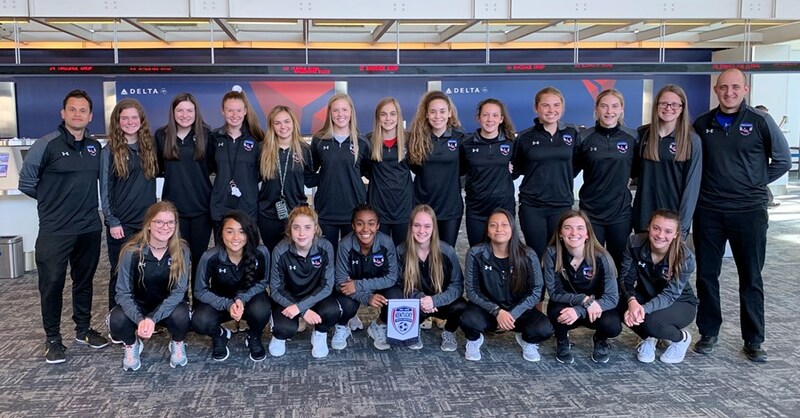 The Kentucky girls ODP team arrived at the Cincinnati airport on March 27th between 4 and 4:30 pm beginning a long journey to Dortmund. The trip was pretty smooth with just a slight a delay in Paris. Everyone was incredibly tired but excited for the days ahead. We arrived in Düsseldorf and were met by our tour directors, Matt and Jurgen. We are lucky to have a double-decker coach to take us around for the duration of the trip as it gives us a unique view while travelling. 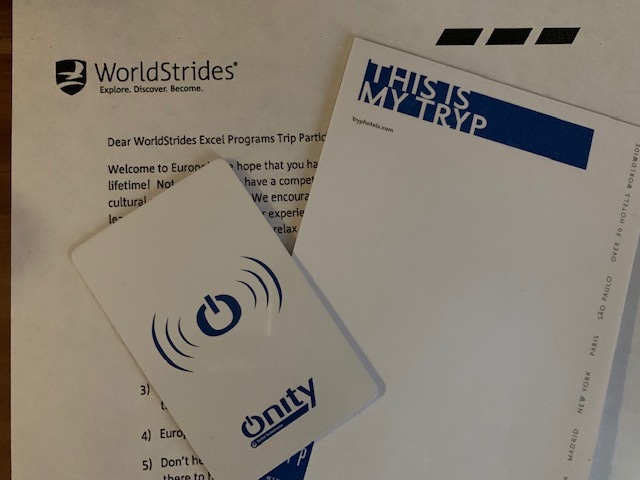 Our first stop was to drop off the parents at their hotel to begin their portion of the trip and then we headed to our hotel in Dortmund. 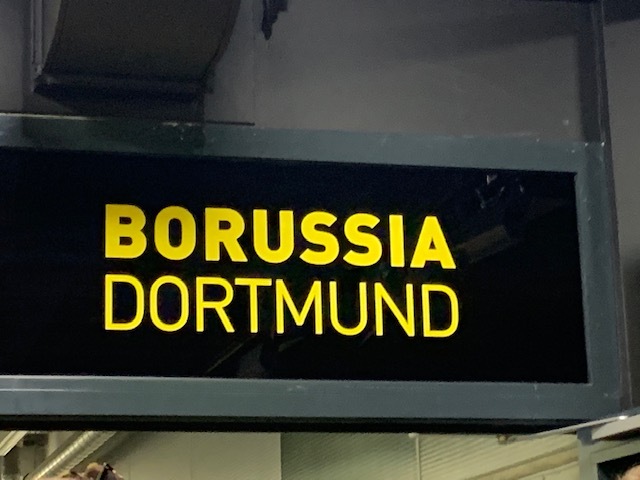 We arrived in Dortmund at approximately 5 pm local time, received our room assignments and got settled in. Some of the girls played cards in the lobby to try to stay awake while others got cleaned up and took the opportunity to relax. 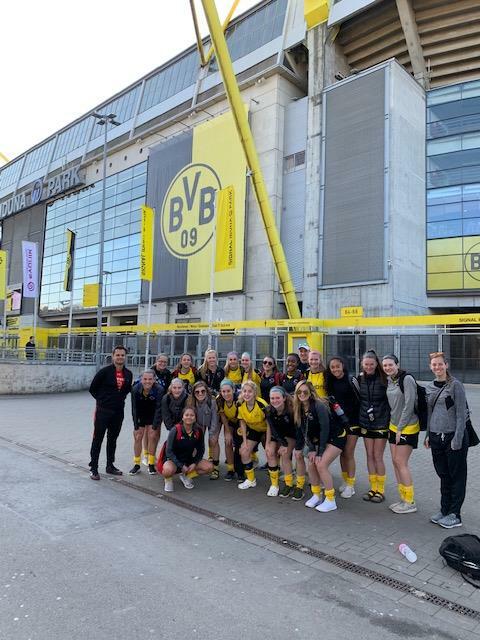 The majority of the group then joined coach Ben and coach Jair on a walk to Signal Iduna Park prior to dinner. 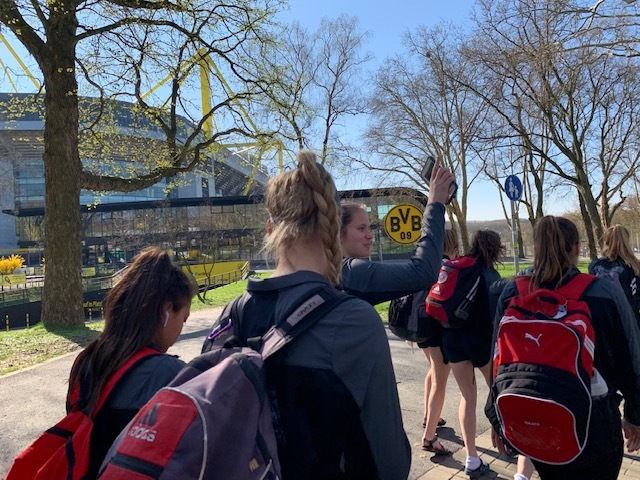 Signal Iduna Park is just a little over a mile from our hotel, so it was a great opportunity for the girls to stretch their legs and get a quick look of the stadium. After dinner we had a team meeting and then the girls headed to bed after an exhausting day of travel. 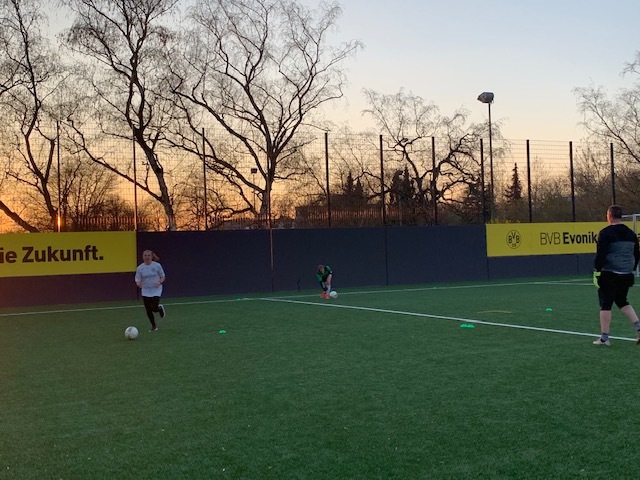 We will be back at it bright and early tomorrow with their first training session at Borussia Dortmund followed by their first game tomorrow evening. The boys had a fairly smooth flight from Louisville to Atlanta then straight to Dusseldorf. 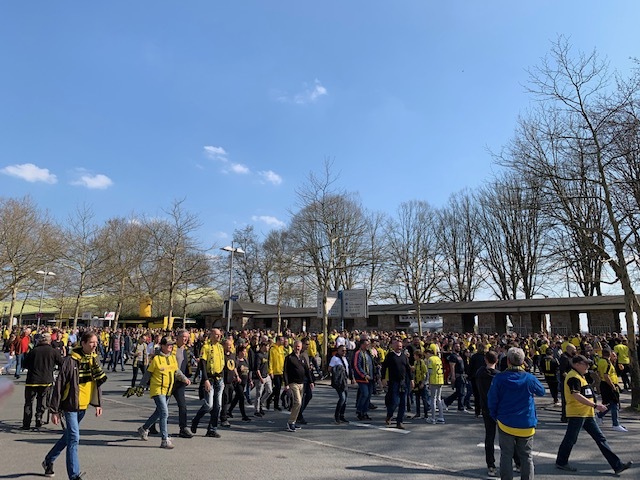 From Düsseldorf, they took the coach to the hotel in Dortmund. 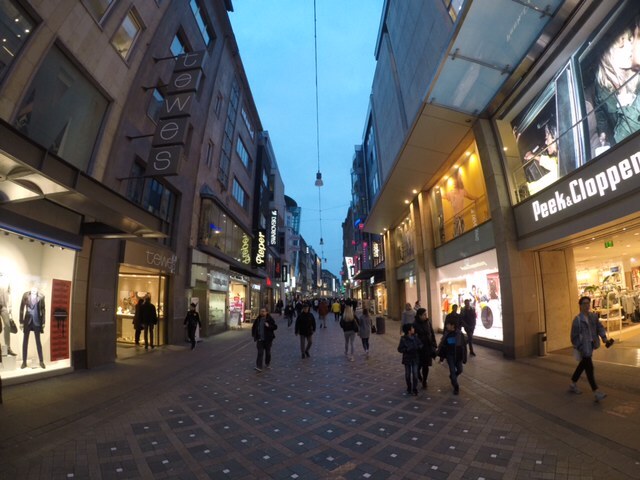 The boys arrived earlier than the girls and had a significant amount of time for sightseeing. 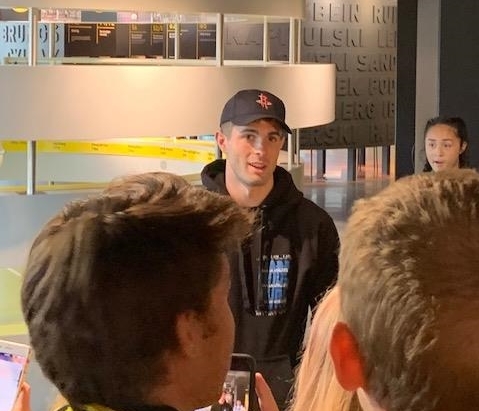 The highlight of their flight came when they noticed that Christian Pulisic, BVB player and US MNT star, was flying back to Germany on their flight after the US MNT game this week. 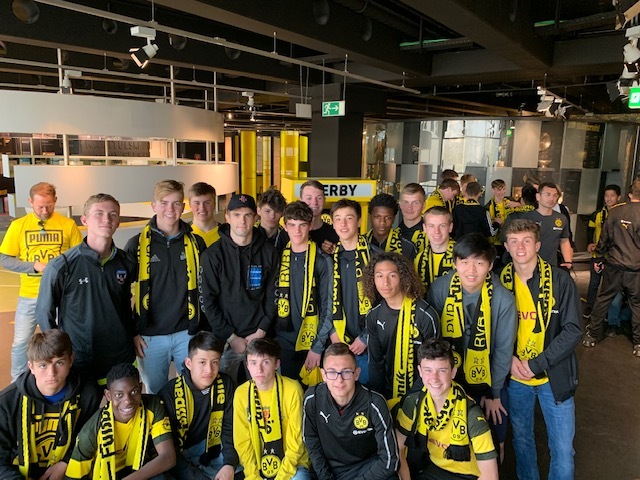 After arriving to Dortmund, the boys visited Signal Iduna Park and had the opportunity to spend some time at the BVB team store. 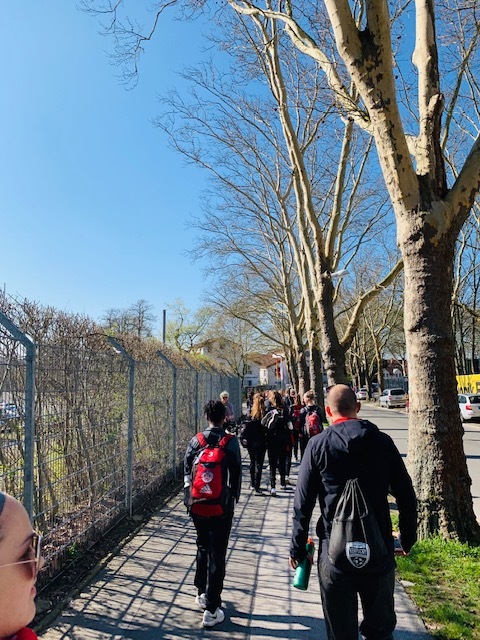 Afterwards, they ate lunch at a restaurant called Strobles near the stadium that offered a wide range of German cuisine. 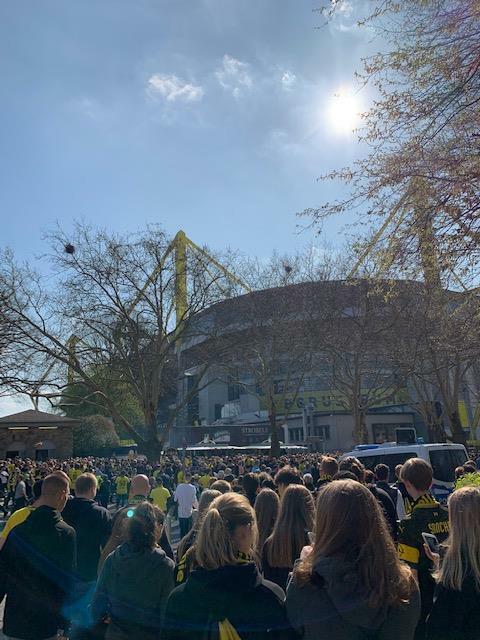 Later in the day, the boys walked around the Hanaplatz are of downtown Dortmund and even started knocking around a ball in the square. Overall, it was an exhausting 24 hours of travel, but with that said, everything went smoothly. 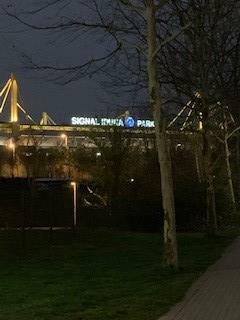 We look forward to the next week training at Borussia Dortmund and participating in some international friendlies! 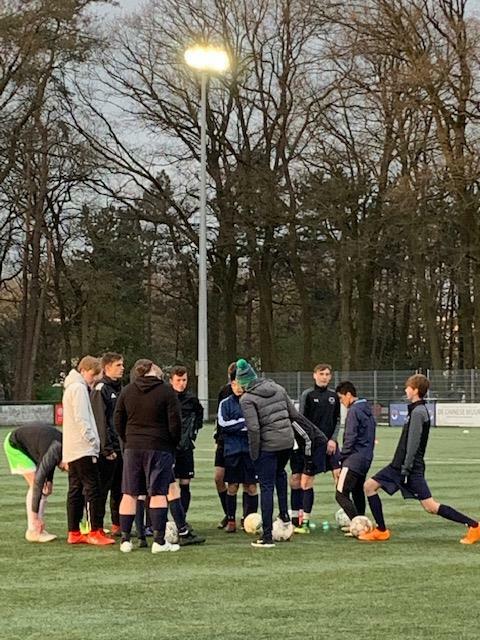 March 29th - Training Day 1 and First International Friendly! What a day! 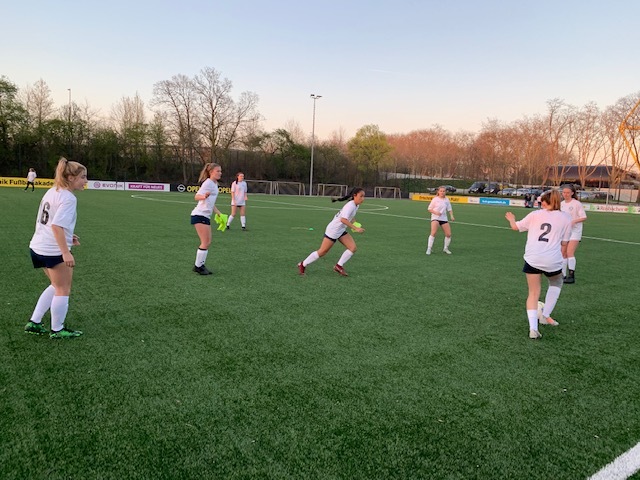 It was absolutely beautiful the entire day with temps in the 60s with the sun shining and the players finally able to train and play! Today started out with a wonderful breakfast at the hotel that included scrambled and hard boiled eggs, bacon, a cheese and meat bar, assortment of breads and muffins, fruits, yogurt and more! 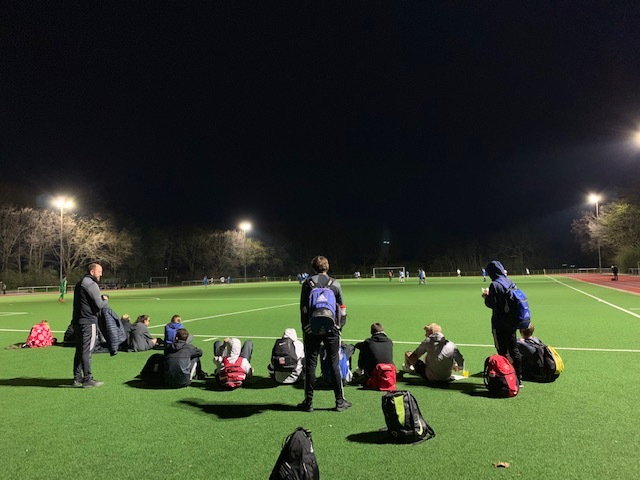 The 02 boys enjoyed the breakfast bright and early at 6 am and left for their first training session a little after 8 am. The 03 boys and the girls came down at 7 to enjoy breakfast and left a little later in the morning. 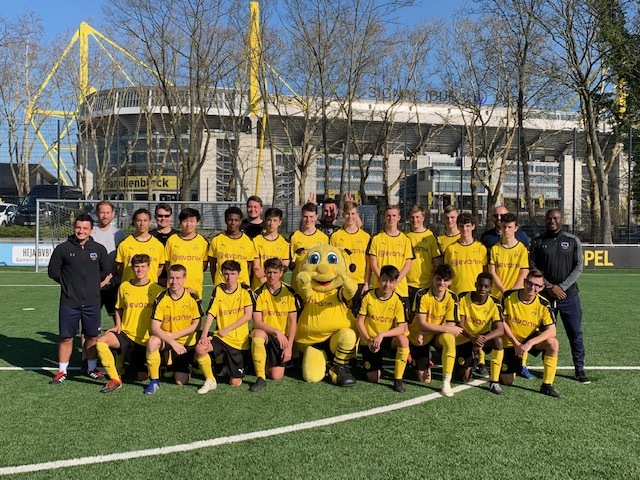 Upon arriving to a Borussia Dortmund training facility, literally in the shadow of Signal Iduna Park, we were greeted by a club liaison as well as the coaches who would be training the players for the next few days. 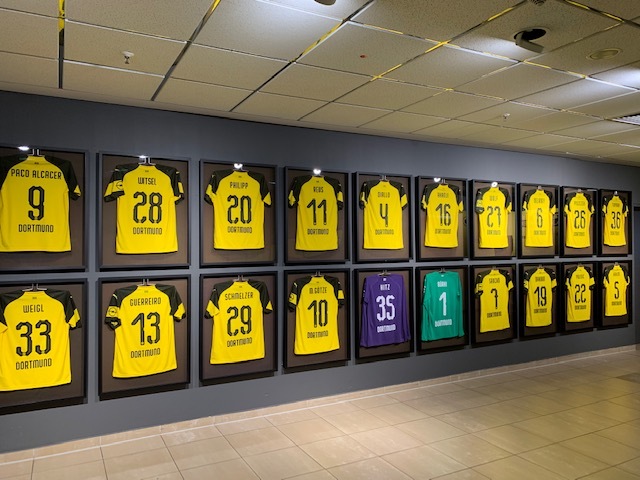 The players went into the locker room to receive a full training kit provided by Borussia Dortmund, changed into it and then had the opportunity to watch a short video showing the history and passion for this club. 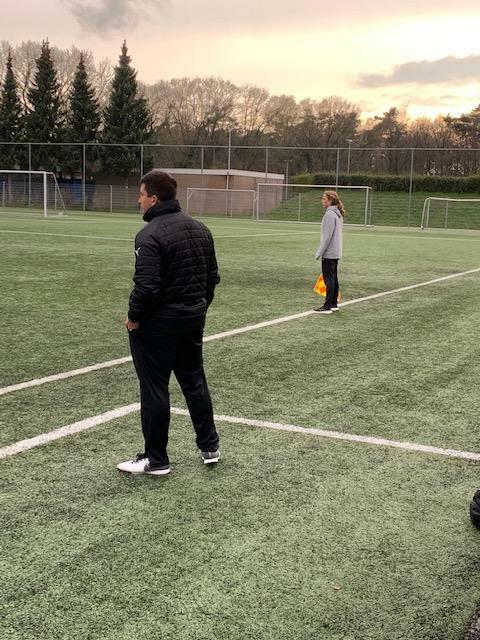 Patrick, the club liaison, then spoke to the players about ground rules for the duration of our time here that we hope will extend beyond that. 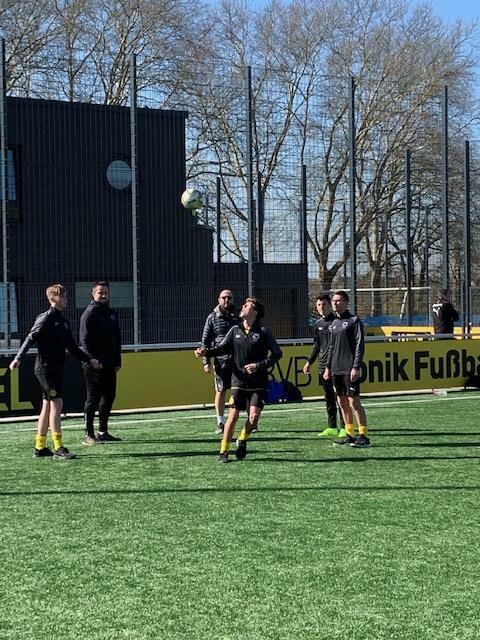 The players then went out to train with their first session of the trip. 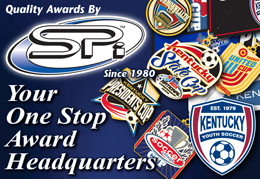 All of the players did a great job in representing Kentucky by working hard and respecting the club. 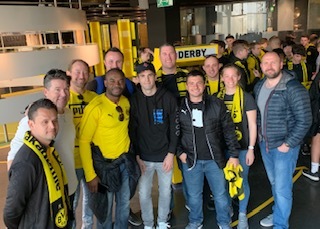 After the first training session, we all had lunch in a VIP lounge at Signal Iduna Park called Borgiasplatz. Once we completed the hefty lunch, all the players went back to the training facility for a team bonding exercise. The players displayed great trust for one another while participating in the team bonding! 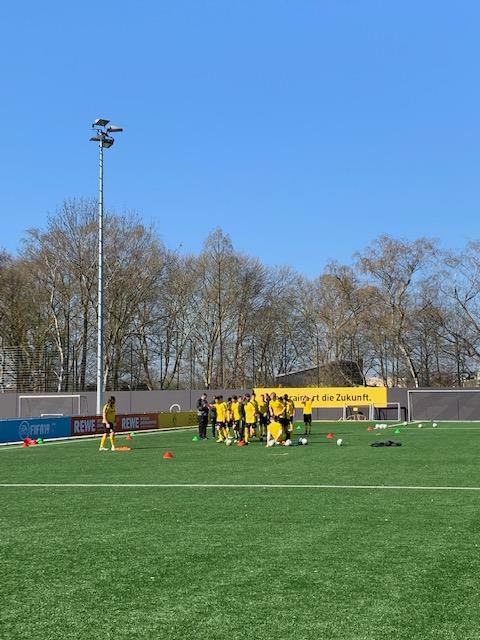 Following the team bonding exercise, the players went into the second training session of the day for all of the teams. 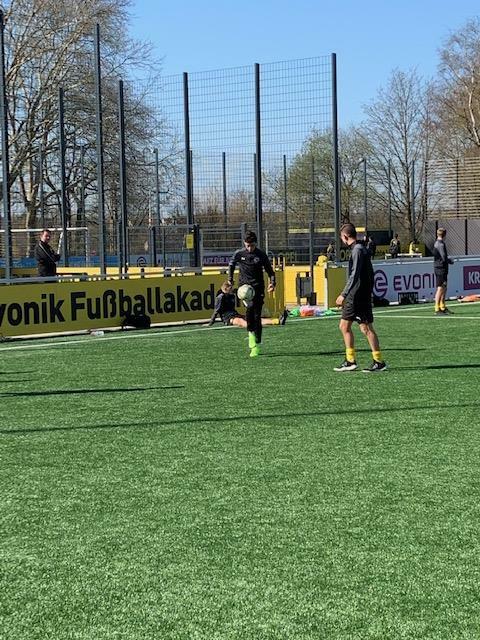 They worked hard and finished up training at around 3:30 pm. 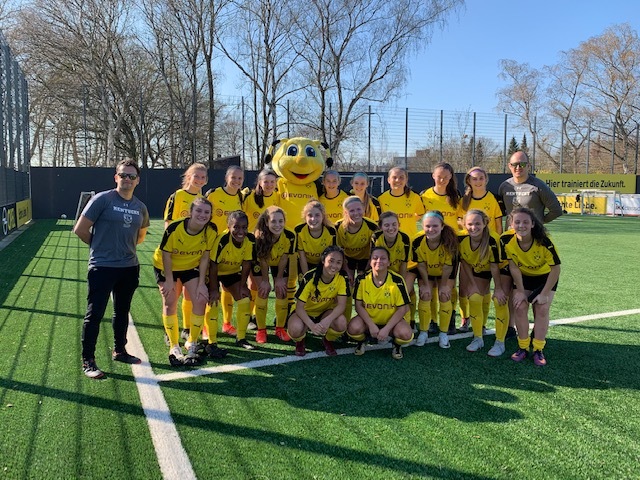 At that time, BVB mascot, Emma, stopped by to say hi to the teams and grab a couple of pictures! 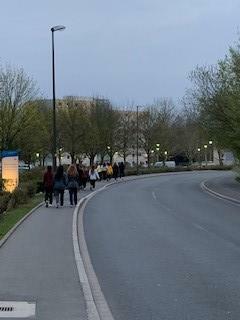 We then headed back to the hotel for some rest prior to the first international friendly that the girls were to play at 7 pm this evening. 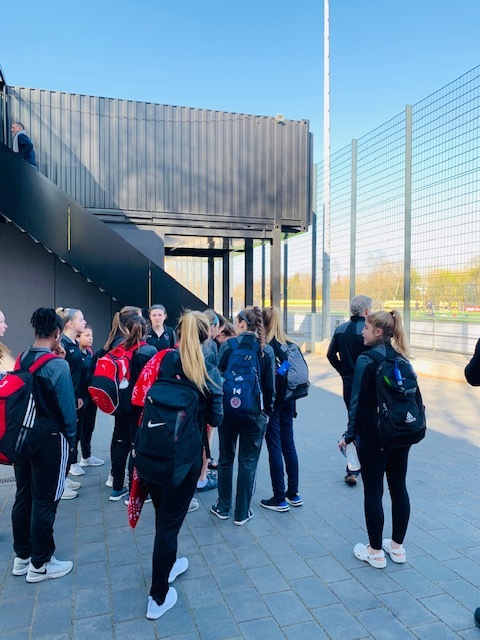 After a couple hours of rest, the girls headed back to the training facility for their game against BSV Heeren. They had great support as the parents who are participating in the parents trip came out to watch the game as well as the boys teams. 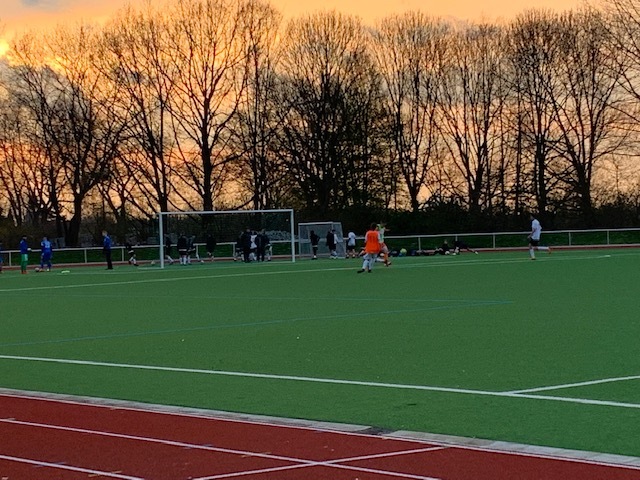 During warm-ups, there was an incredible sunset giving an amazing backdrop for the field! The captain on the field today was Grace Barber. 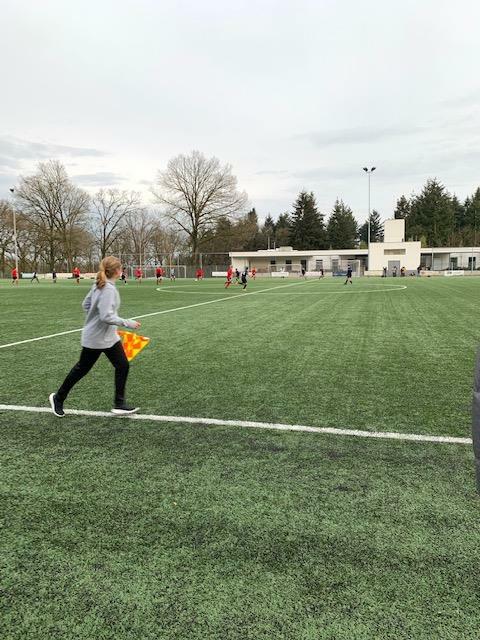 She had the opportunity to trade pennants with BSV Heeren prior to kickoff. When the game kicked off, the girls started off a little slowly. 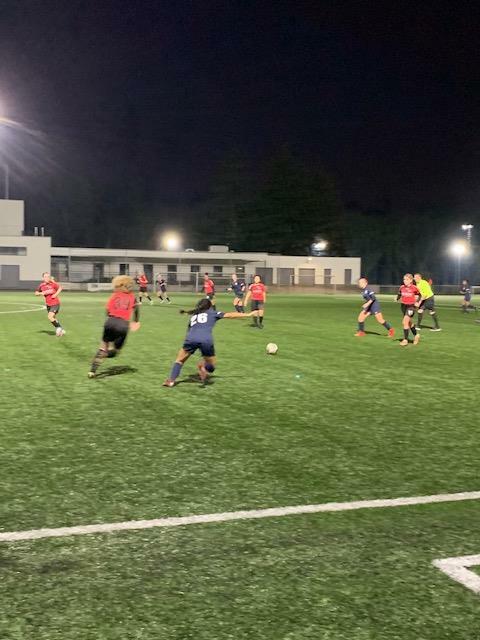 However, they quickly turned it around coming away with a 5-3 win in their first friendly. 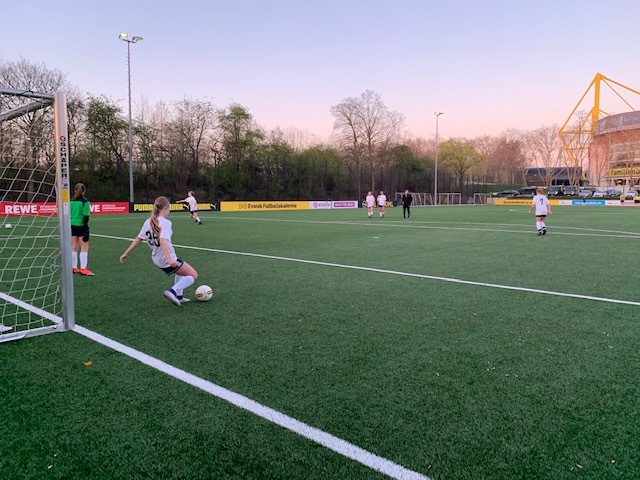 Though, the important takeaway from the game was not the scoreline but the grit, determination and ability to come back from being down 3-2 in a game that the girls showed. This is particularly true after they had two intense training sessions earlier in the day. We had a ton of fun watching the team and look forward to the rest of the games! 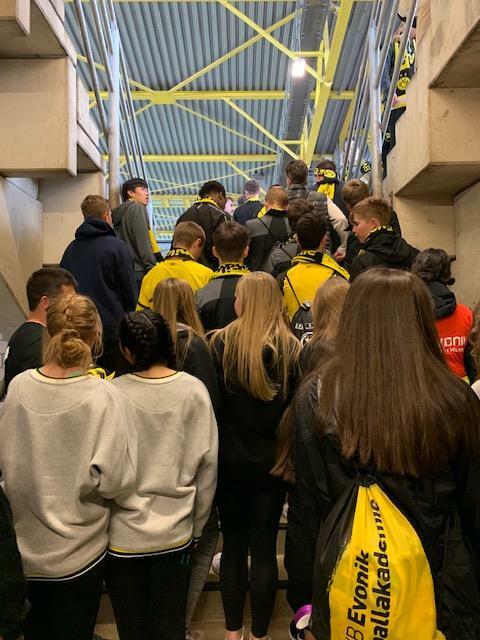 We would be remiss if we did not share that during the game, the Borussia Dortmund first team were right by the training facility and some of the 02 and 03 boy players were able to get some autographs! Finally, we headed back to the hotel and grabbed a late dinner before the players headed back to their room for some shut eye. 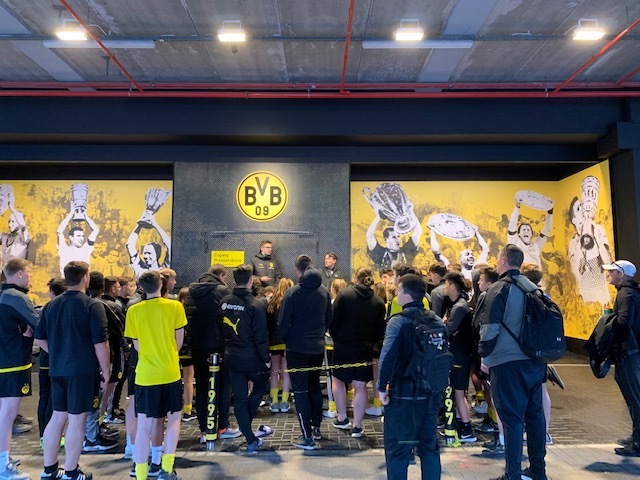 We have a big day tomorrow with morning training sessions followed up by going to the Borussia Dortmund vs. Wolfsburg in the afternoon! We can't wait to share about that experience tomorrow evening! We were lucky enough to have another incredibly beautiful day today. 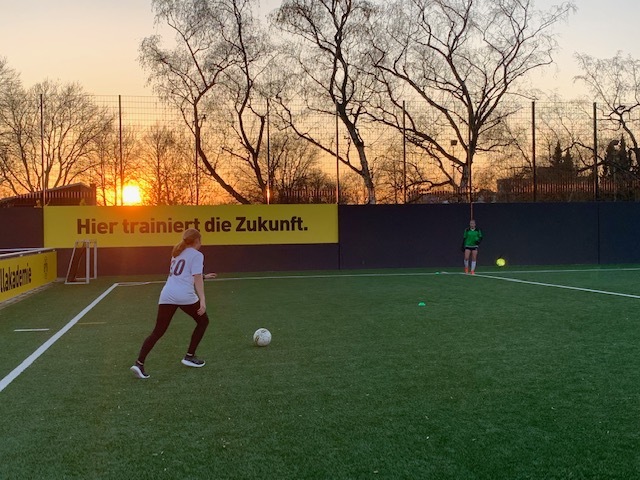 With mild temperatures and sunshine, it was an ideal day for training and to attend a Bundesliga game. 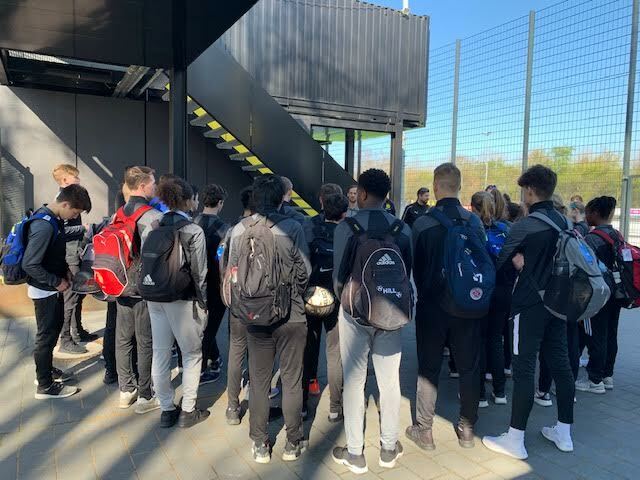 The day started out early for both boys’ teams as they had breakfast at 6 am in order to leave for their early morning training. 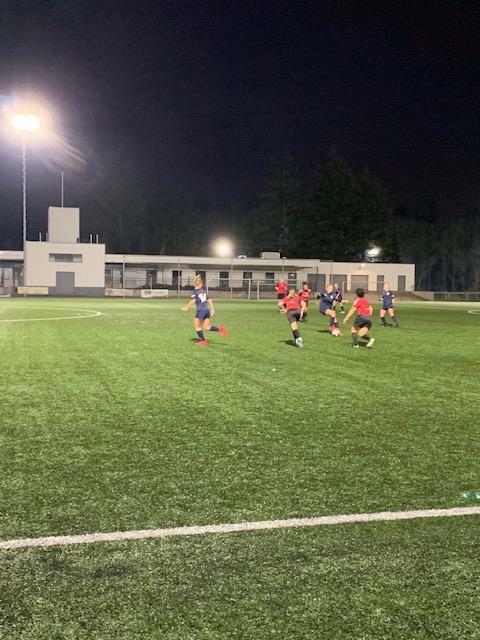 The boys had a solid day on the field with their trainers and are putting in some great work to prepare for their first international friendly on Monday! 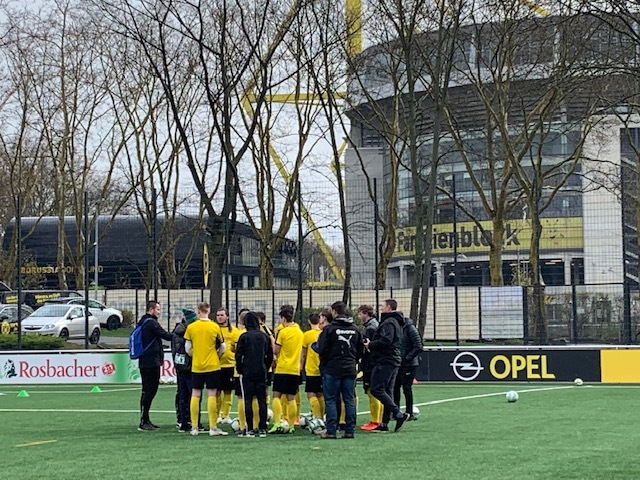 At the end of training this morning, the Borussia Dortmund trainers handed out Borussia Dortmund scarves to all of the players to wear to the game. Afterwards, the boys headed back to the hotel for some rest and to get ready for the game in the afternoon. 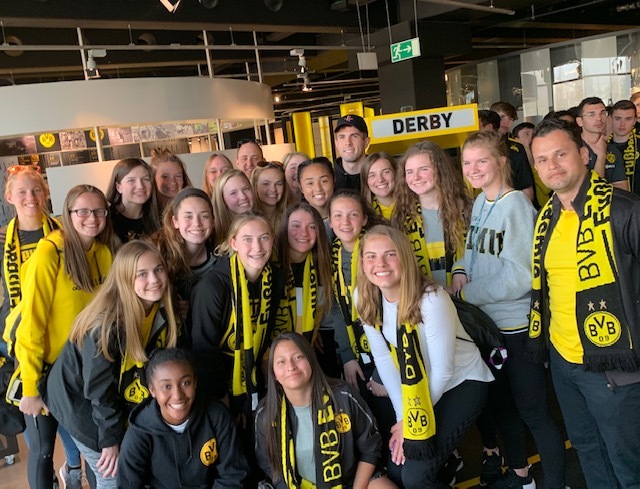 The girls had breakfast at 7 am in order to get to Signal Iduna Park for some pre-training shopping at the Fan Store. 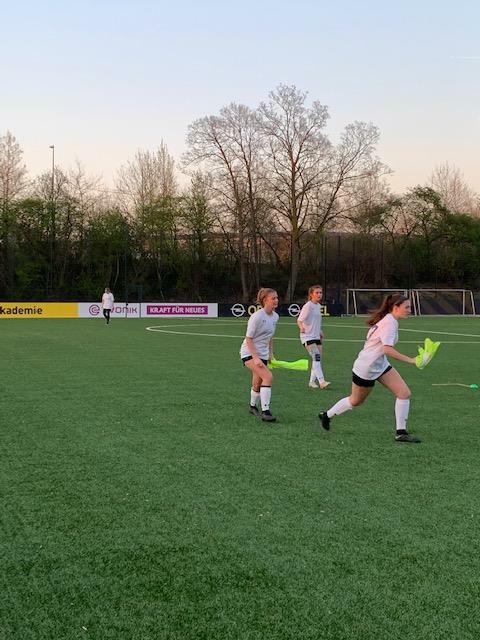 Unfortunately, we were not aware that the store did not open until 10 am, so rather than shopping, the girls headed to the training facility to get some extended stretching in after a long day yesterday. They had a good training day that included some entertainment from one of our tour directors, Jürgen! 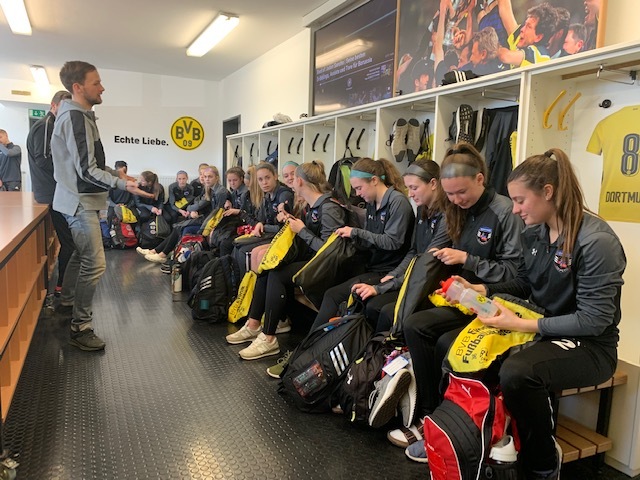 When the girls completed training, they also received a Borussia Dortmund scarf from the trainers and then headed to the fan shop to get some shopping in before the game! Back at the hotel we all had a traditional German meal with mashed potatoes, pork, a variety of sausages, meatballs, brussel sprouts and fish. Not everyone ate the full German meal, but most seemed to give it a try. 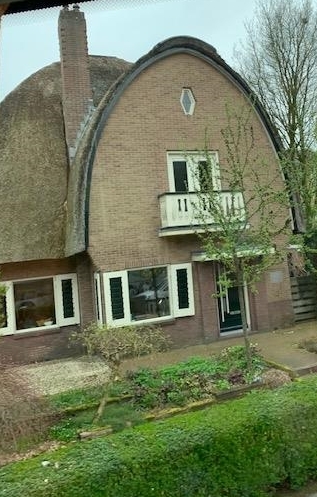 They may have simply been hungry, but they ate most of what they picked up. 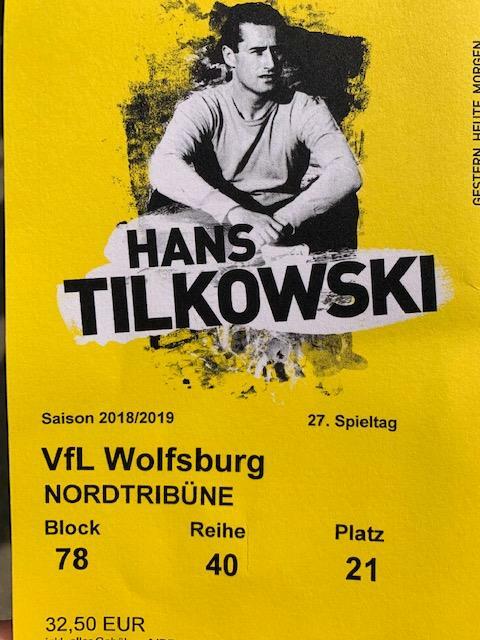 The teams headed to the Bundesliga game between Borussia Dortmund and Wolfsburg at around 2 pm. 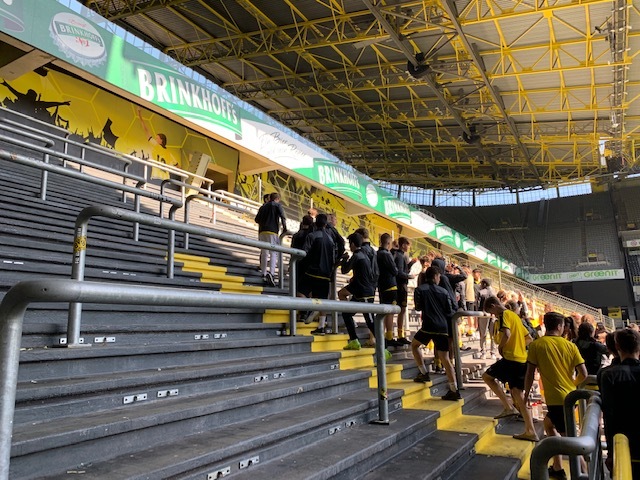 For those who are unaware, Signal Iduna Park holds 82,000 fans, so we planned carefully to make sure the crew stayed together. When we arrived, it was PACKED, so it was a challenge to stay together, but we made it to a separate entrance as a group. We were able to meet up with the parent’s trip and enjoy the game with them. The game started off a little slowly, but the atmosphere was incredible! Nothing like most of us have seen before. 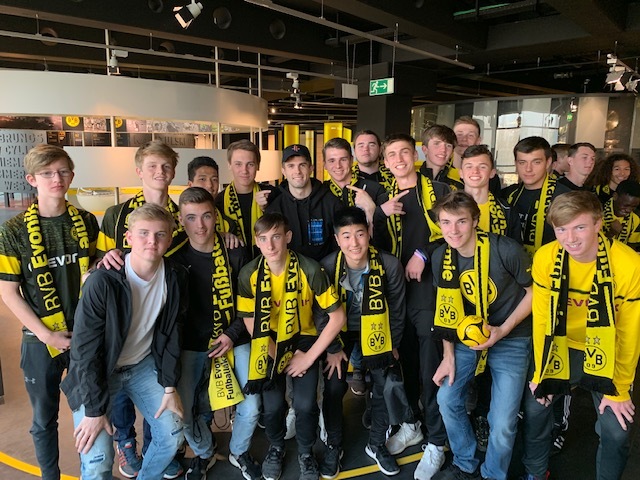 At half-time, we had an unbelievable opportunity to meet up with Christian Pulisic! 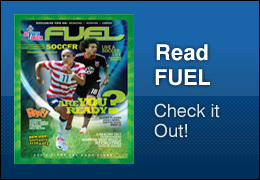 He is currently unable to play due to an injury sustained with the US MNT. Christian was nice enough to answer some question for us, get some pictures with each team and give out some quick autographs. Unfortunately, he had to quickly head out, so not every player was able to have something autographed. 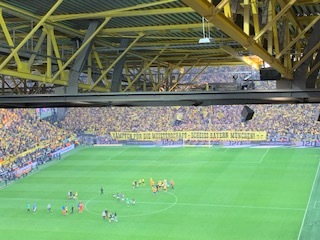 Borussia Dortmund FINALLY scored 2 goals in the final minutes of the game to earn three points in Bundesliga. The kids were still buzzing from the game and the experience of meeting with Christian on the way back to the hotel and during dinner. This day is at the top of the list for the best thus far! 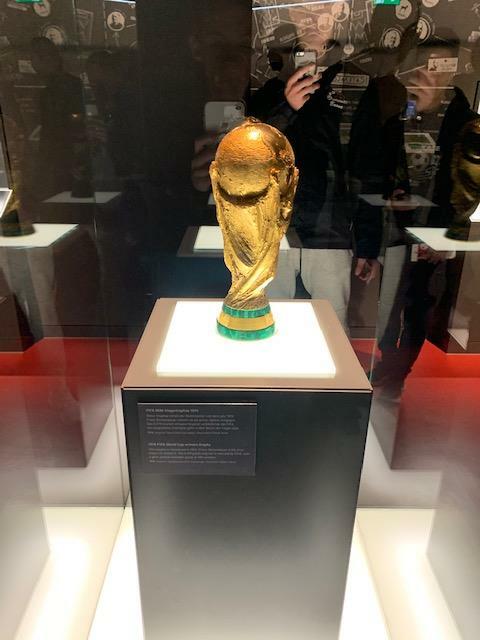 March 31st - German Football Museum & Second International Friendly! Today was a busy day for everyone despite not having any training sessions scheduled. The good news was that breakfast was little later this morning starting at 8:30 am. The bad news was that we went through a time change last night, so we lost an hour of sleep. 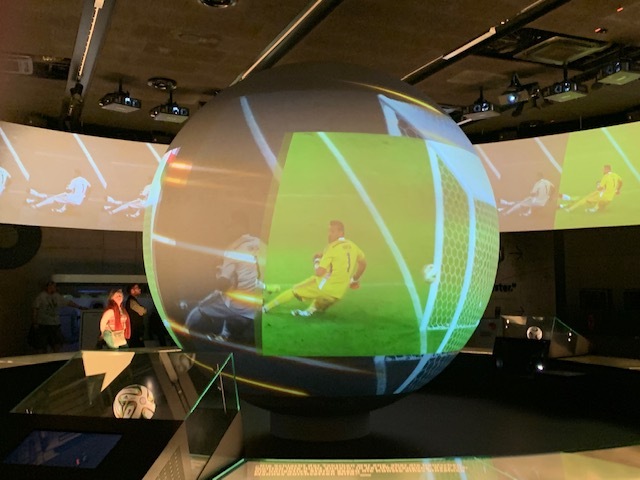 In the morning, we visited the German Football Museum where we had a chance to see the incredible history of the game in Germany. The parents, who are here, were able to join us for the tour. 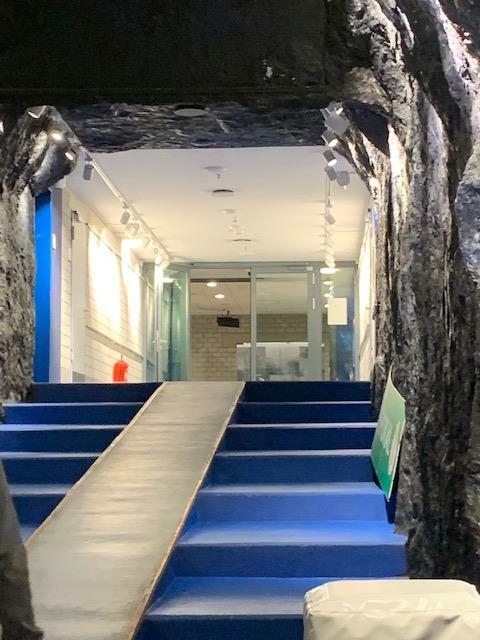 It was a great way for some of the kids to spend some time with their parents and walk the museum together. 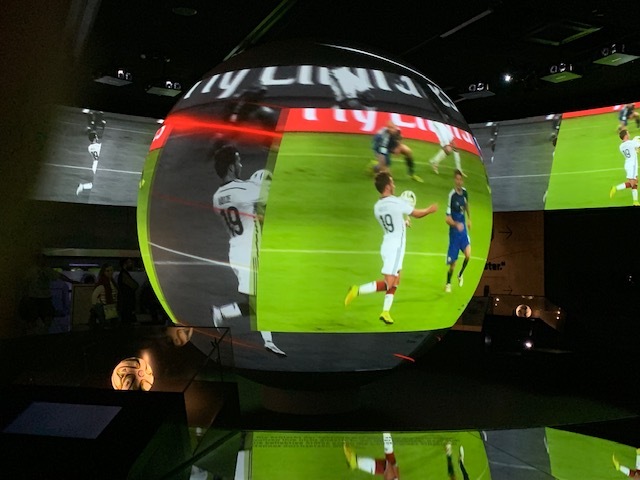 When the players finished with the museum tour, many of the boys went outside to play a fast-paced game in a caged-in area outside the museum. It was fast moving and entertaining to watch. 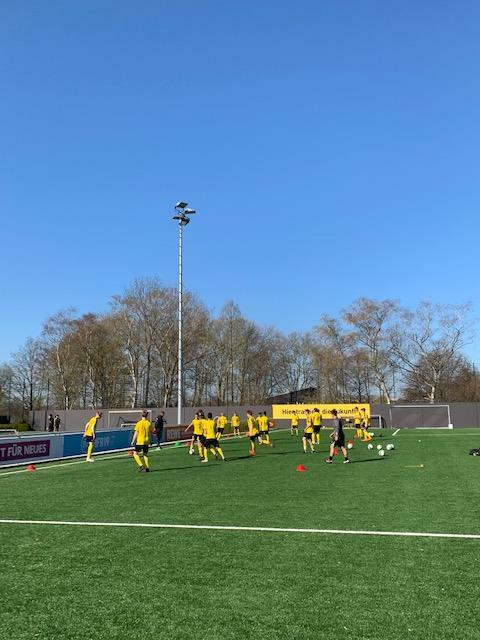 This was a great way to get the boys moving as they did not have training or a game today, so they needed to have the opportunity to burn some energy. 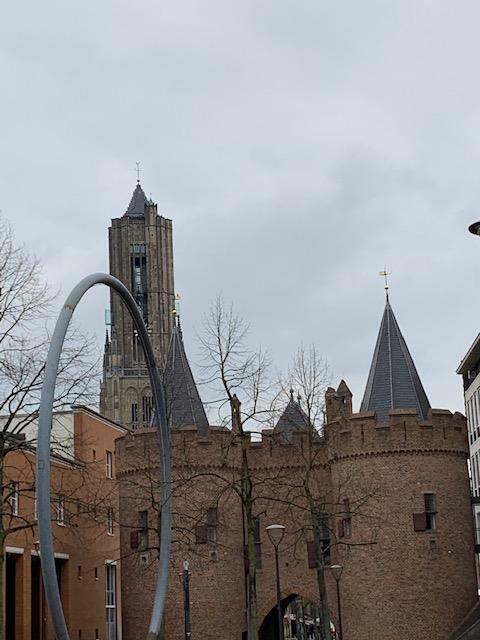 Lunch at Wenkers followed up the German Museum tour. The parents also joined us for lunch, but it everyone was separated into their respective sections. The players and coaches had the opportunity to pre-order their meals. 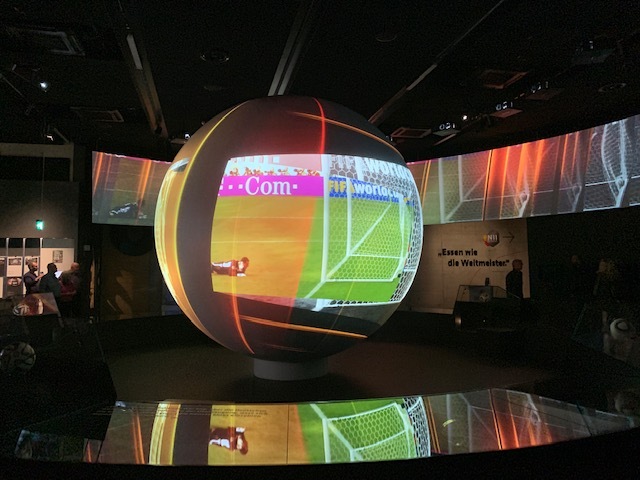 There was a large variety of options that the players could choose from including a kid’s box (some of the players took advantage of this option). 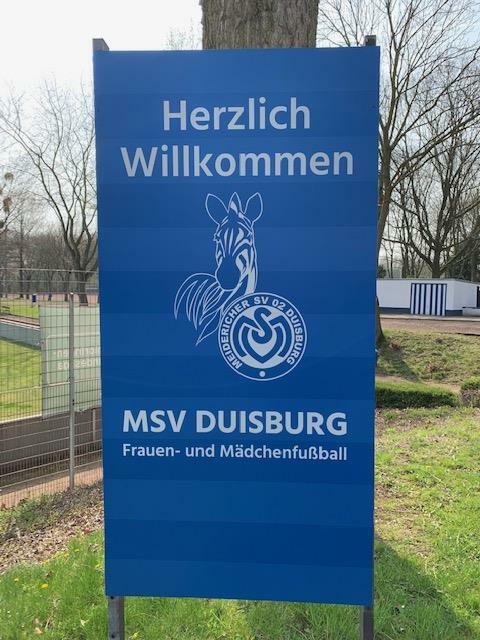 The girls headed to their second international friendly against MSV Duisburg which is about 50 minutes away. 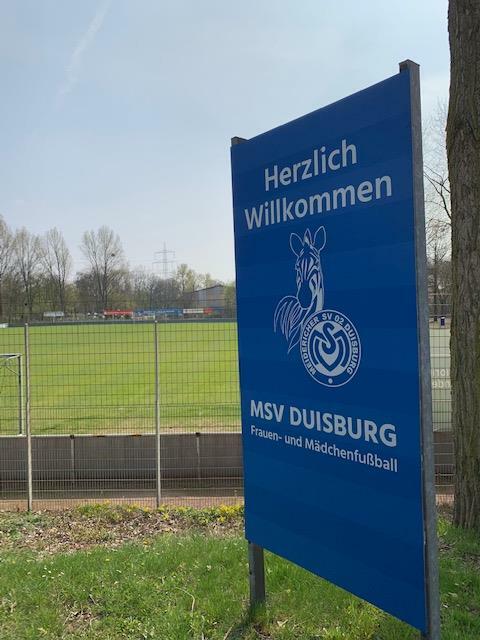 The facility at Duisburg had three pitches – a grass field for the first team to train on, a clay pitch and a turf pitch. 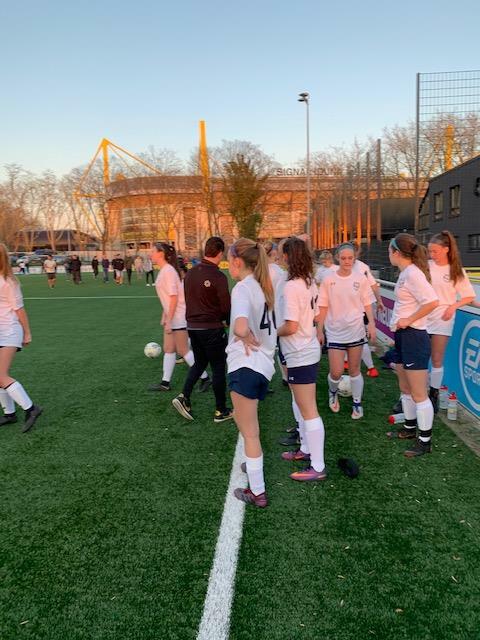 The girls played their game on the turf pitch. 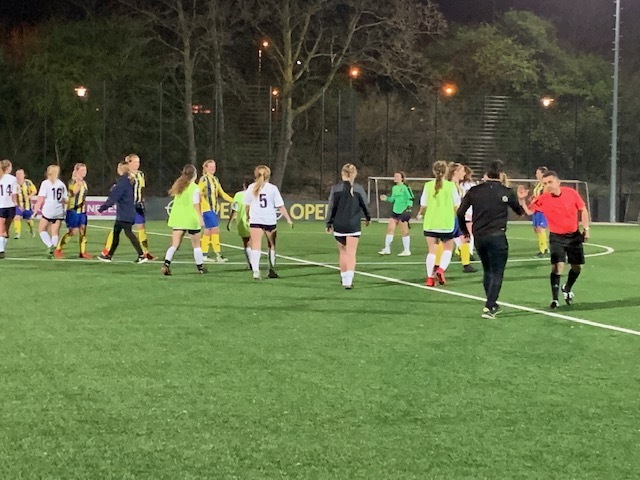 They started out playing a fast-paced game and quickly learned how difficult it can be to hold that type of pace in a game for 45 minutes especially on a field where the ball plays incredibly fast. They slowed the pace some in the second half and moved the ball around really well. Rather than going to the girl’s game, the boys went back to the hotel and had team meetings with their coaches. 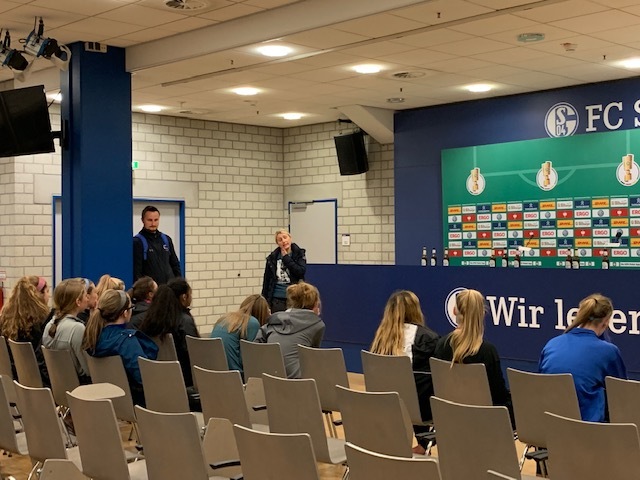 Their first game is on Monday, April 1, so they had the opportunity to discuss tactics. They also had the chance to get a little more rest before their schedule gets packed for the next few days with three games in three days. Dinner was at the hotel followed by distributing the clean training kits from the laundry service. 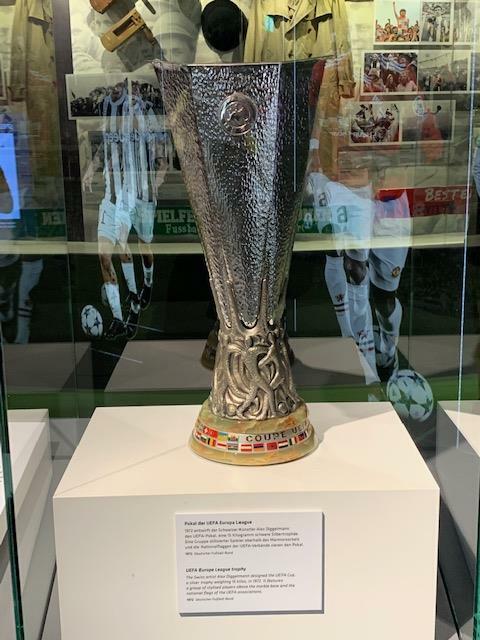 April 1st - Stadium Tour and First International Friendly for the Boys! We have been incredibly lucky this week with the weather in Germany! Today was another perfect day to play with a slight chill in the air but a ton of sunshine. 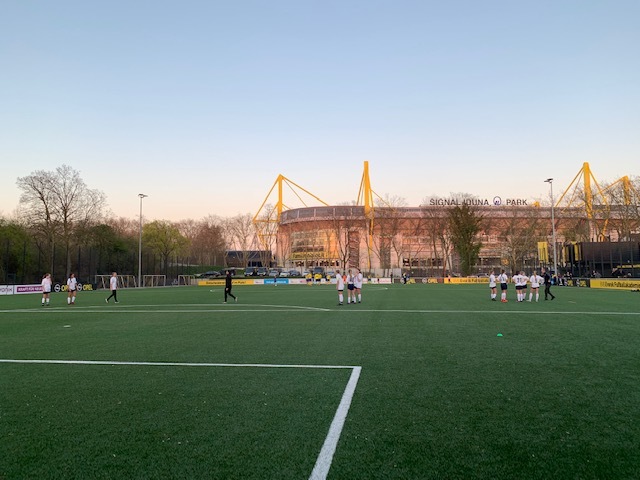 The day started as many of them have thus far with a training session at Borussia Dortmund first thing after breakfast in the hotel. 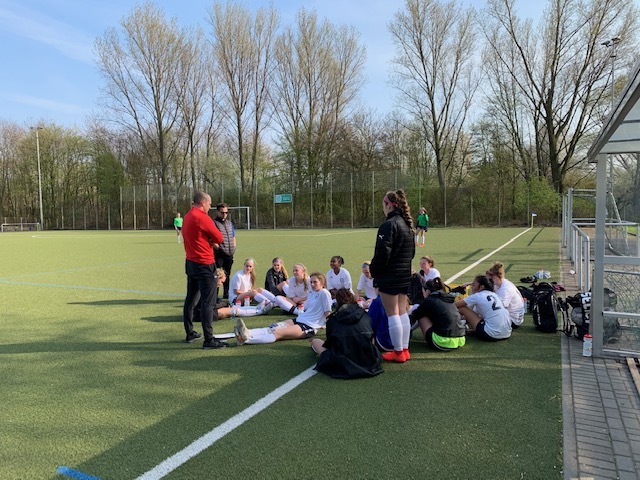 The girls are a little beaten up after two games and several training sessions, so a couple of them had to sit the session out/take it easy in order to aid their recovery. 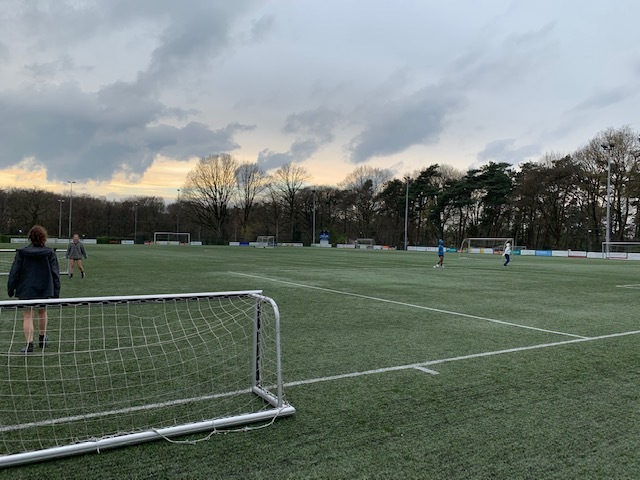 With another training session scheduled for the afternoon and an evening game, the boys still worked hard in fairly intense morning session. 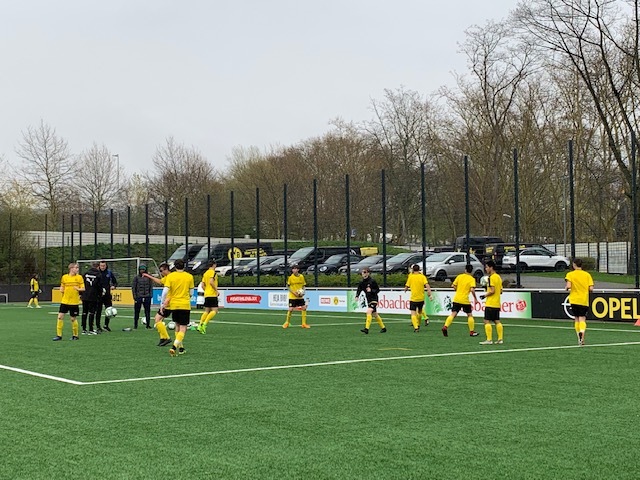 The afternoon session for the 02 boys was light and consisted of small side games mostly Rondos some different restrictions. 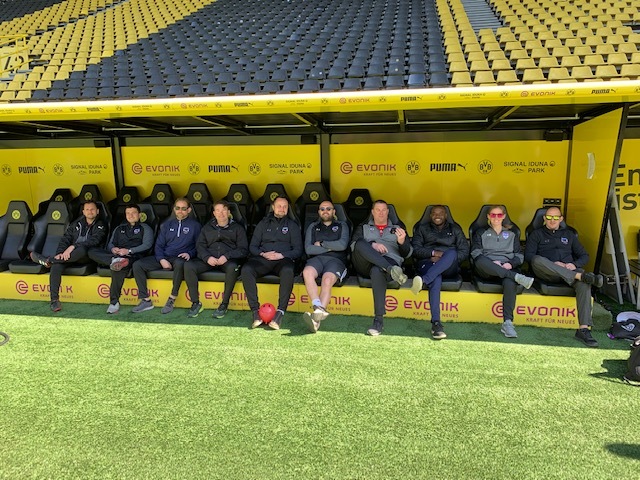 We had another lunch in the VIP area of Signal Iduna Park followed by a tour of the stadium. What an experience that was! The tour started out near the section we sat on Saturday, but a little closer to the field. 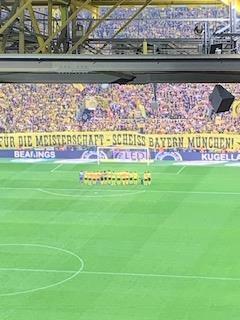 We had a great view of the pitch and could really get a good look at the section called the Yellow Wall. 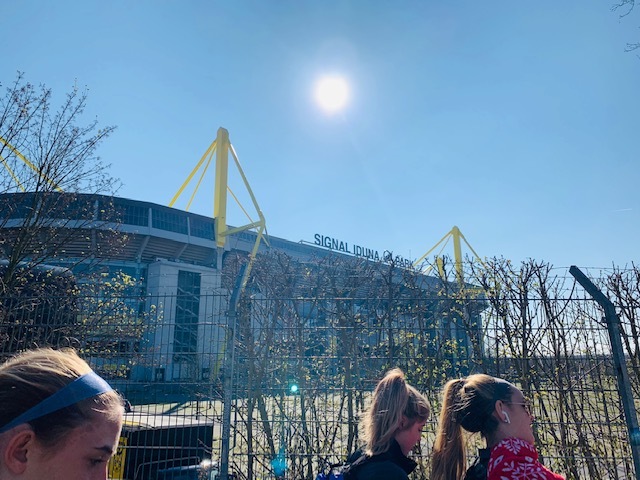 Our tour guide gave us some history on Signal Iduna Park including the fact that it is the largest stadium in Germany holding just under 82,000 fans. 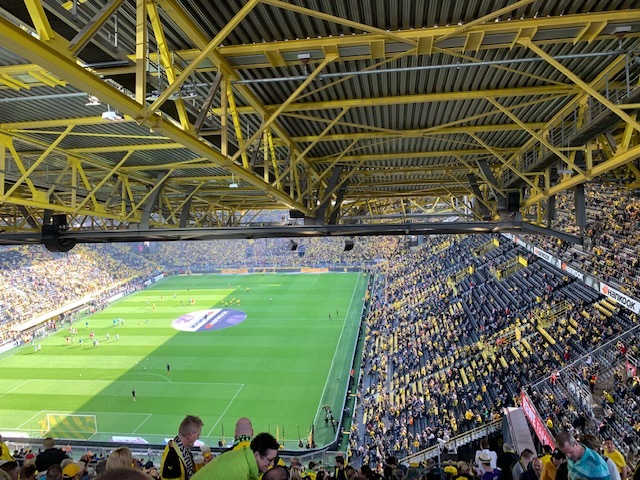 The section dubbed the Yellow Wall holds 25,000 alone with everyone standing creating the illusion of a yellow (or black) wall depending on the colors worn for each game. 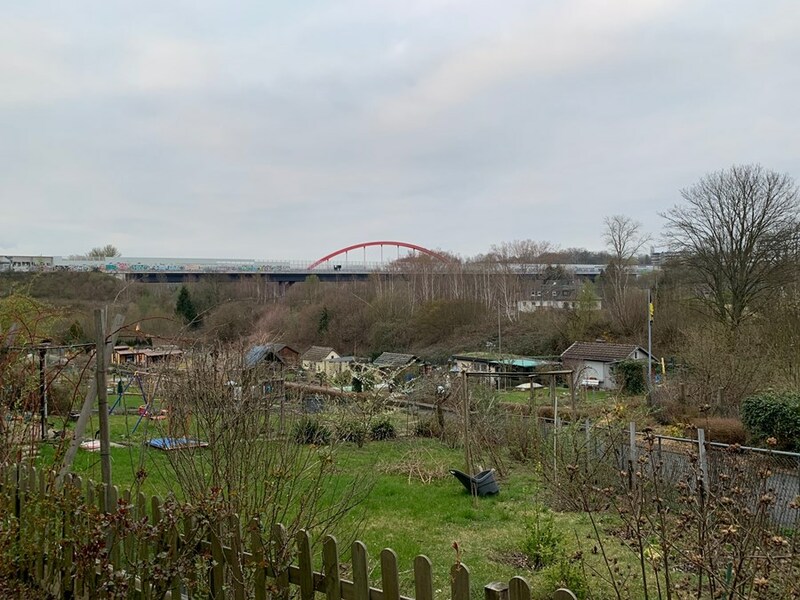 We also learned that it was not always the largest stadium in Germany. The stadium was built in 1974 holding just over 50,000 fans but they started adding in sections in the 90s. 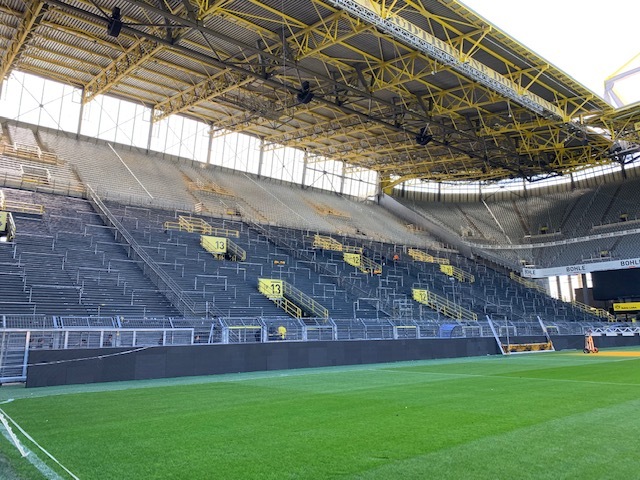 Finally, in 2003 enough seats were added to make the stadium larger than any other in Germany. 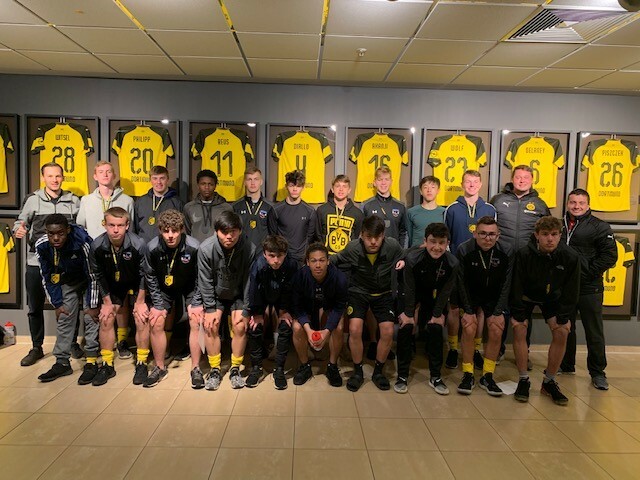 We made our way to the player entrance and had the chance to check out the Borussia Dortmund locker room. 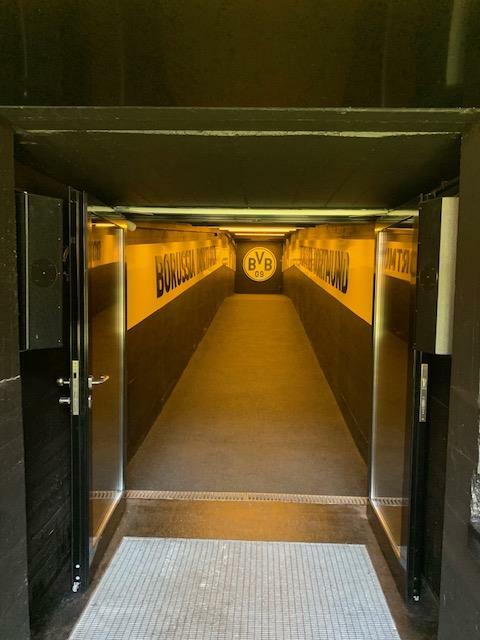 Next, we walked through the player tunnel while they were playing audio of fans cheering – the experience was second to none! From there, we had the chance to sit where the coaches and players sit during the game. 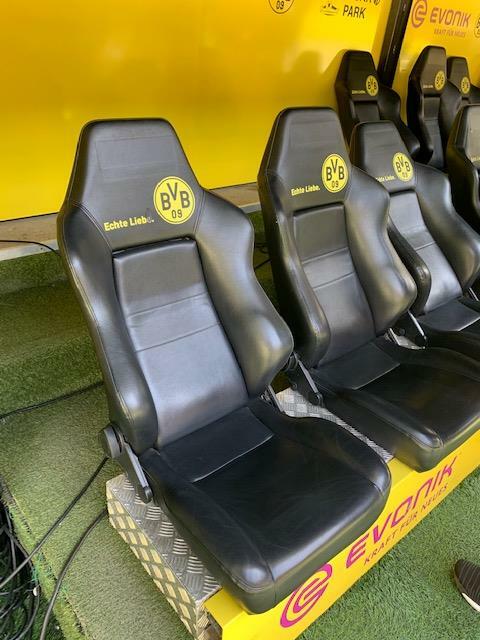 We learned that they have heated seats with each player (for Borussia Dortmund) having the ability to turn the heated seat on or off. The away team also has heated seats, but they cannot be controlled individually. 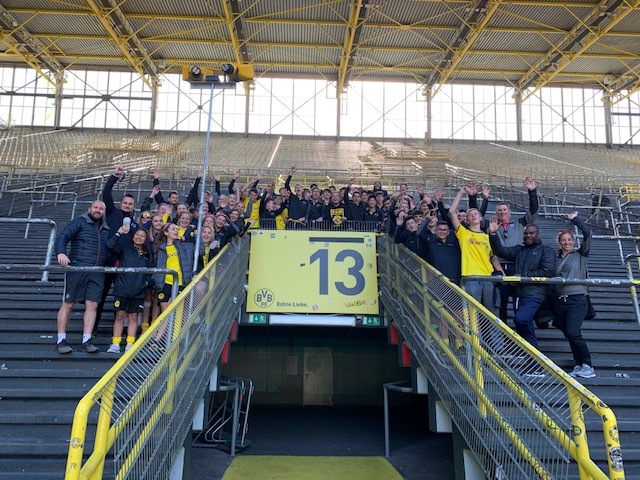 Finally, we made our way to the Yellow Wall and got a great group picture of the players and staff. This section is a standing only section with no seats at all. 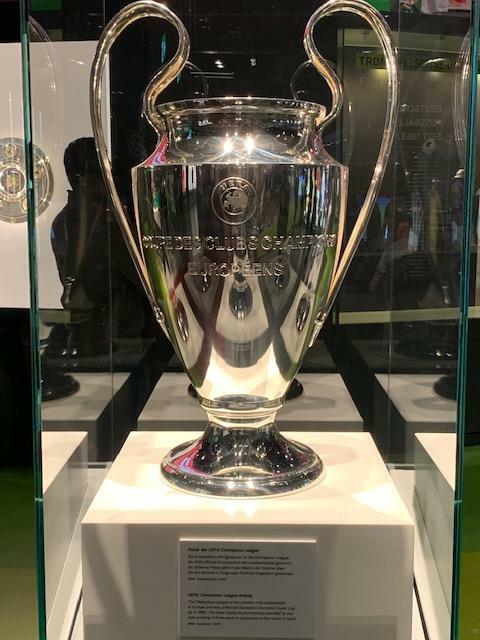 However, it was interesting to learn that since all fans have to have seats for Champions League games that seats are added for those games which makes the stadium capacity drop from around 82,000 to approximately 65,000. After the stadium tour, the players headed back to the training facility for their second training of the day. 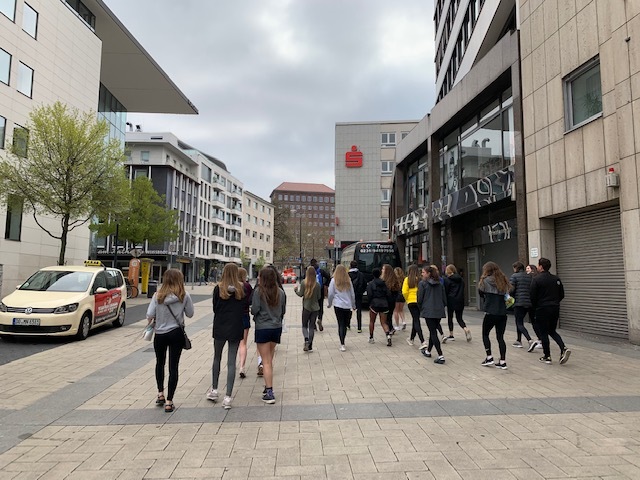 When training was complete, everyone headed back to the hotel where the girls got ready to head to downtown Dortmund for some free time shopping and the boys got ready to head to their respective games. 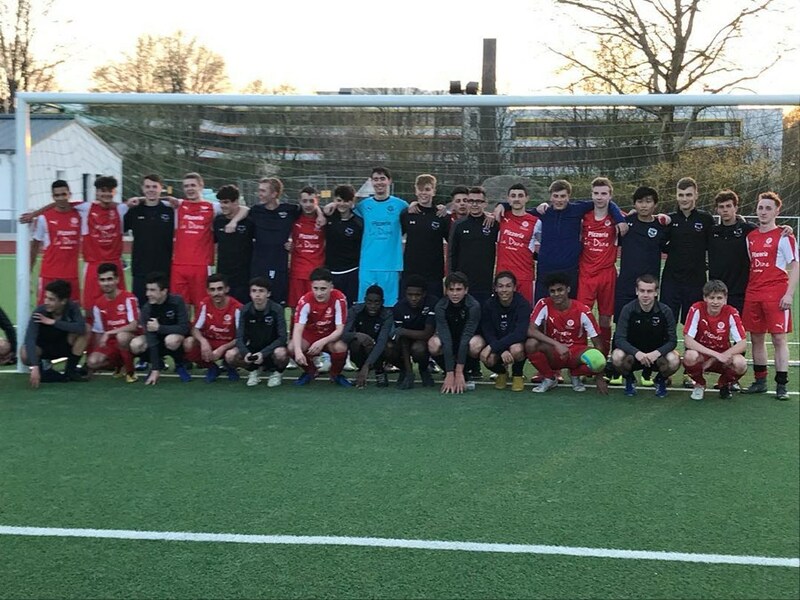 The 02 boys and 03 boys both played teams from SV Brackel . 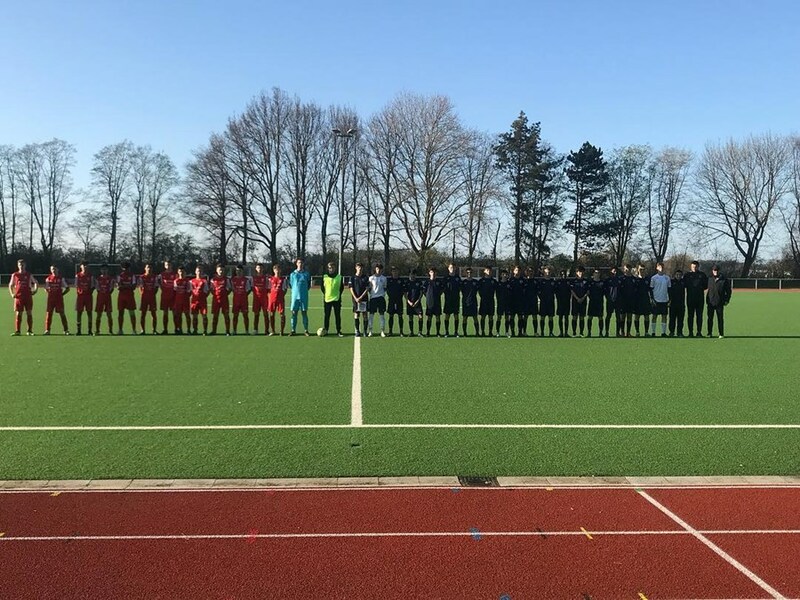 The 2002 boys lost their first international match 4-1 against SV Brackel. The first half was very sluggish as the players struggled with fitness and fatigue. Adjustments were made in the second half and the team played better. They pressed high and controlled the midfield better creating multiple chances but could not capitalize on them. 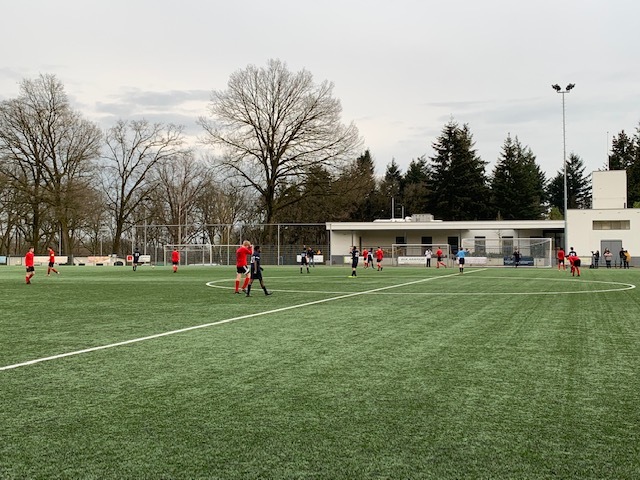 The team maintained a 4-3-3 formation the entire game and was able to control the game with adjustments made in the second half. 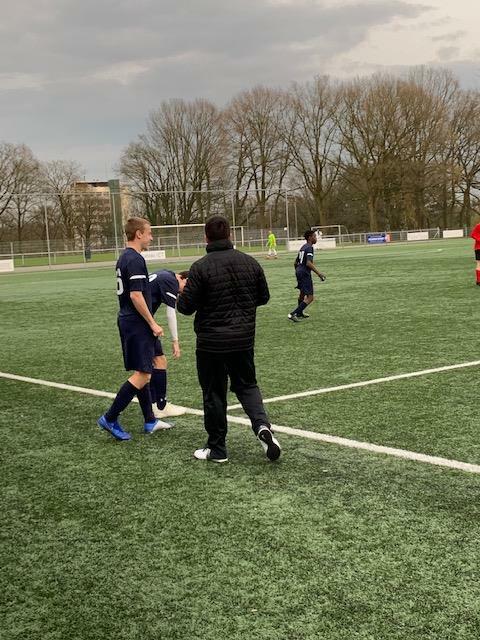 Overall, Coach Marcel was satisfied with the second half play as the boys were able to put into practice the adjustments that were made. 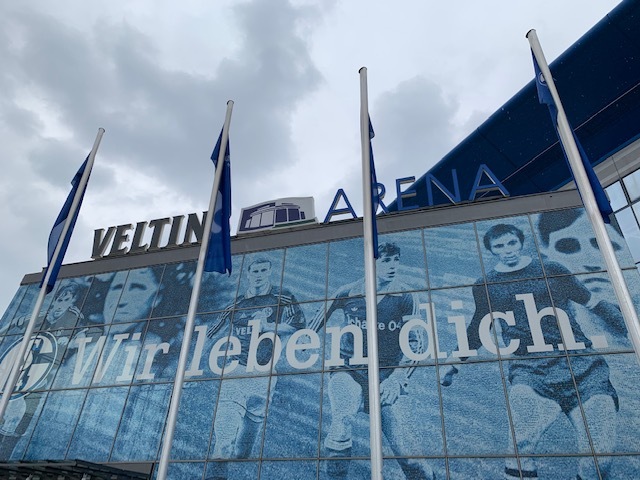 The 2003 Kentucky boys ODP team earned a positive result in their first German International match against SV Brackel. 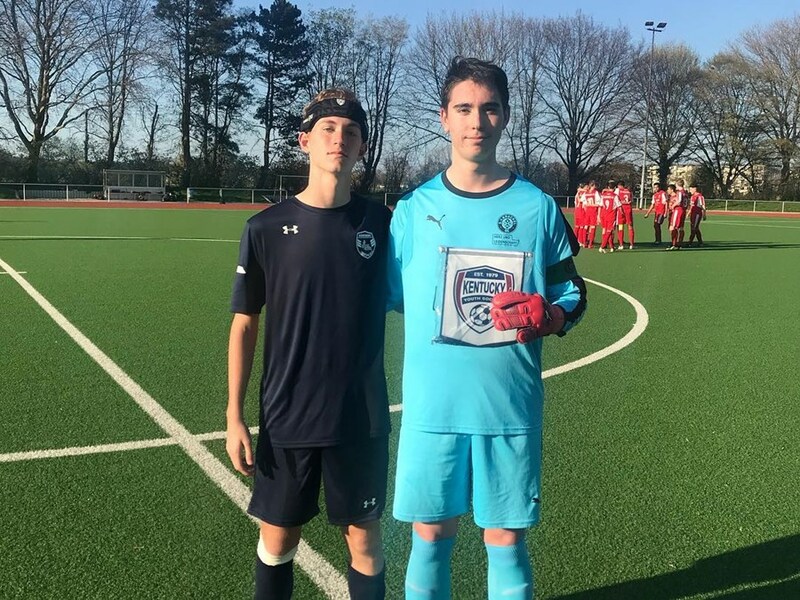 They competed against a German team which consisted of boys born in both 2002 and 2003. Kentucky ODP was scored on by a penalty kick in the first ten minutes. They responded by scoring 5 goals in the 15th, 30th, 43rd, 49th and 52nd minutes. The final score was Kentucky ODP 5 SV Brackel 2. 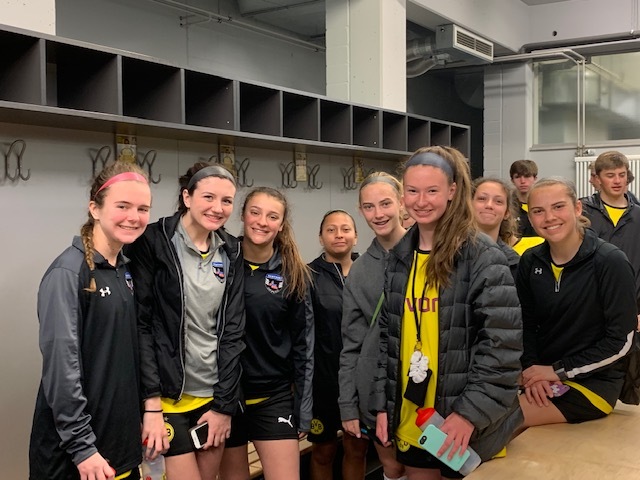 Kentucky ODP had superior ball movement throughout the match and defensively did not give their opponent time on the ball. Coach Mike said it was an “overall outstanding effort by our team”. 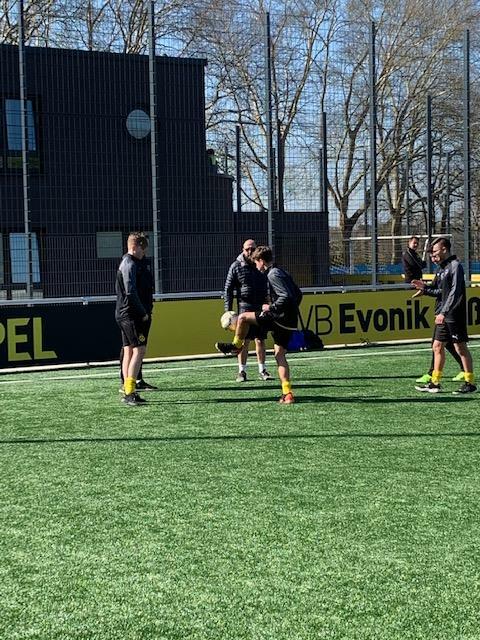 Today was a long day that started out with training at Dortmund. 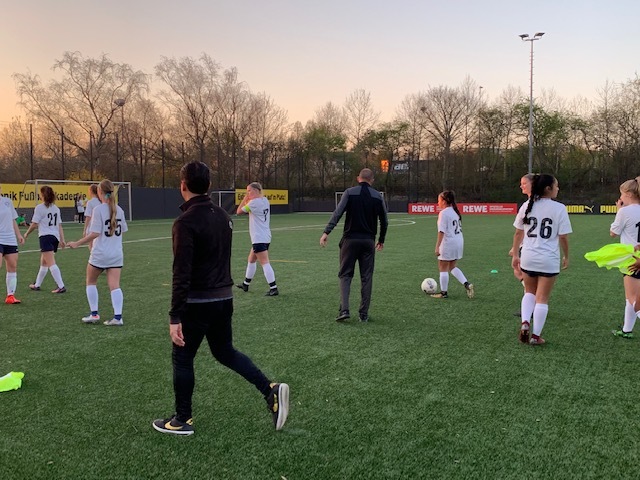 The girls had the early start with a 6:30 am breakfast and an 8:30 am training time while the boys got a little extra rest with a 7 am breakfast and 10 am training. 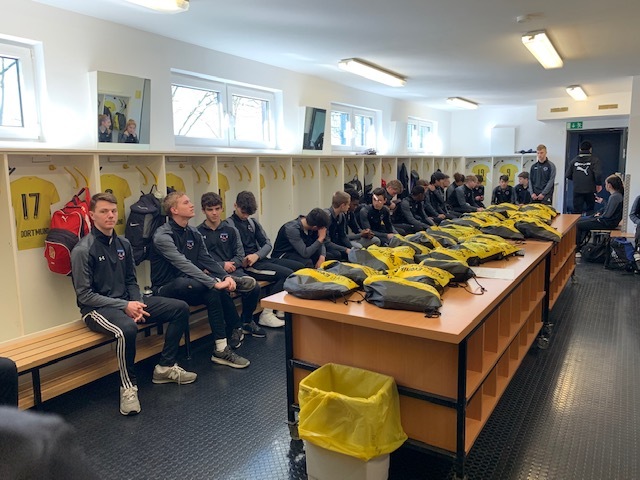 Training was followed by lunch in the VIP area at the stadium. The kids have been hit or miss on the meals and this one didn’t go over particularly well. We have had a lot of rice and chicken/pork or noodles and chicken/pork. Today's meal was similar to a sweet and sour chicken dish – some of the kids didn’t particularly enjoy it. 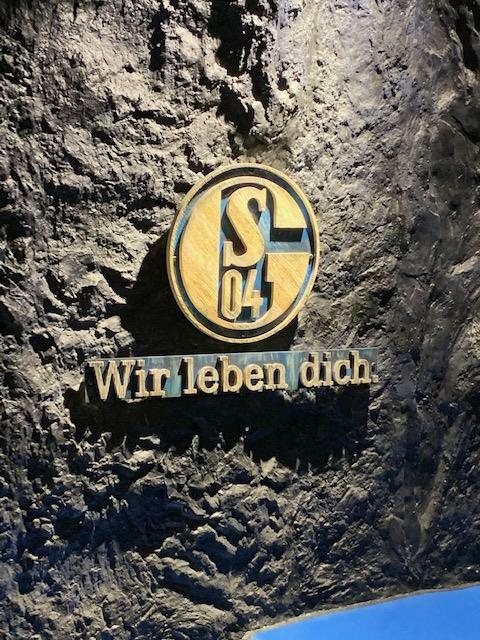 We then headed to Schalke for a stadium tour and to visit the team shop. 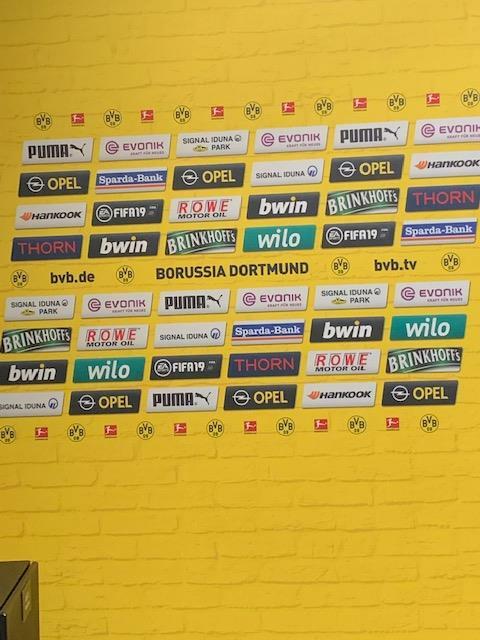 We were given explicit instructions NOT to wear any yellow or anything with Dortmund on it during our visit. 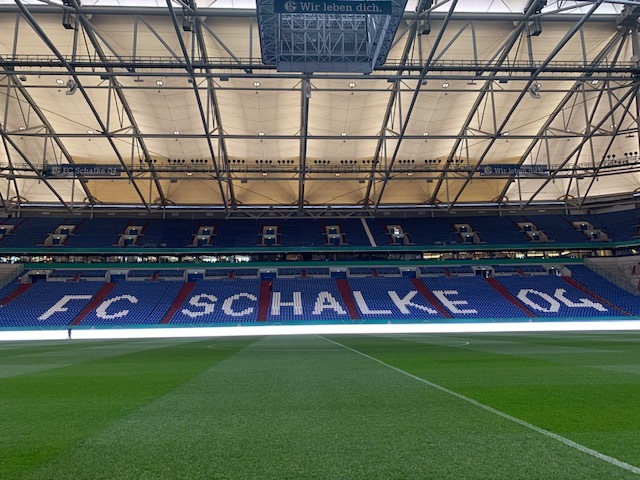 The Schalke stadium has a very unique feature in that the field does not actually stay inside the stadium. The pitch is rolled out after games into a parking lot right outside the stadium and sits in the sunlight to promote a healthy field. 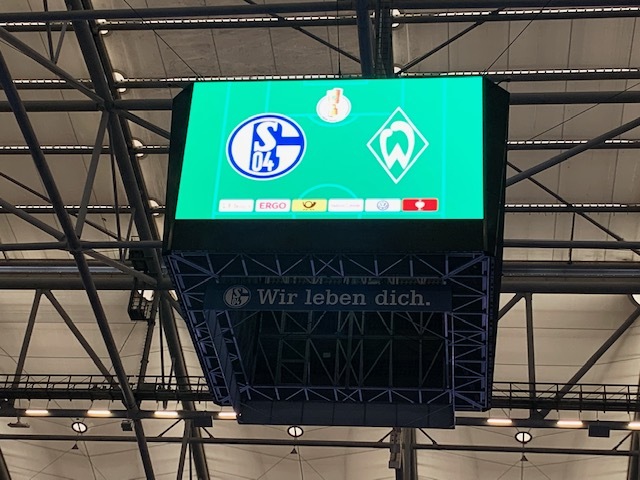 We were lucky that Schalke has a Cup game tomorrow, so they had already rolled in the pitch and were prepping for game day. We were told that it takes about 4 hours to roll the field in and out AND that it is quite an expensive process. It was an incredible experience to see everything coming together for game day. 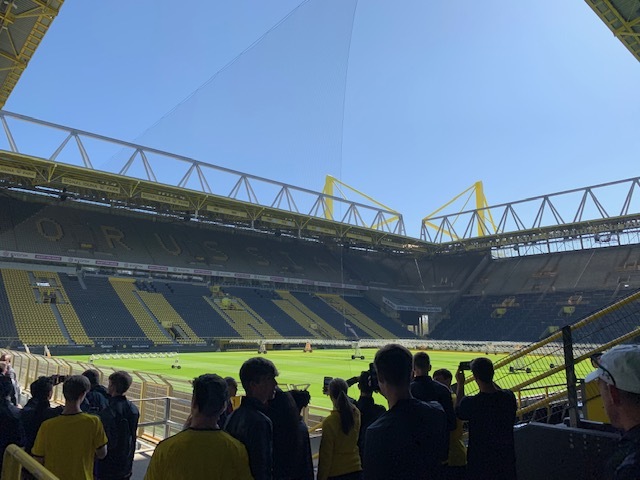 The stadium also has a roof that can open and close depending on the weather. 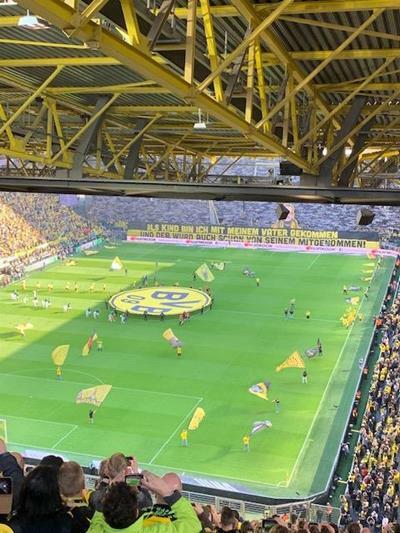 We were told that it is the decision of the referee on whether the roof should be open and takes about 30 minutes. 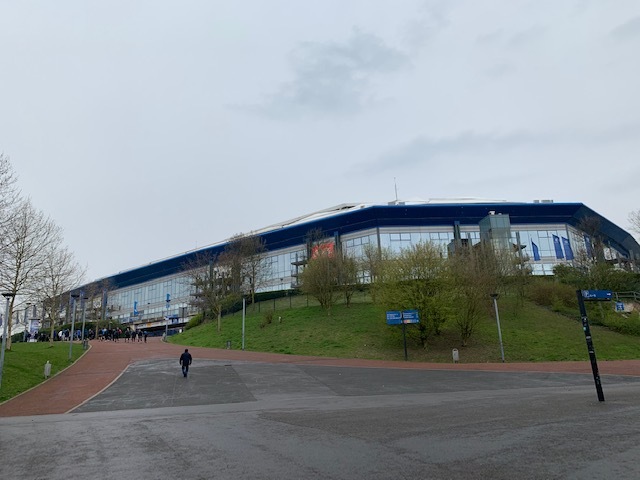 In addition to a football stadium, Veltin Arena is a huge concert venue. After the stadium tour, the players had some time to shop in the fan store. 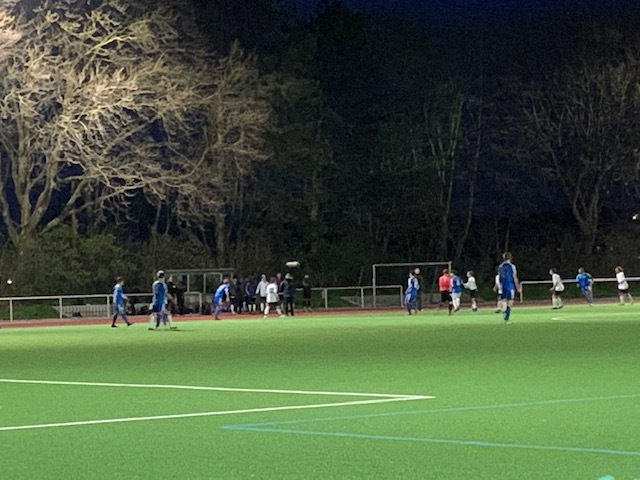 Both boys’ teams had matches against FC Brunninghausen. The girls had not had the opportunity to see the boys play yet, so everyone made their way to the games. 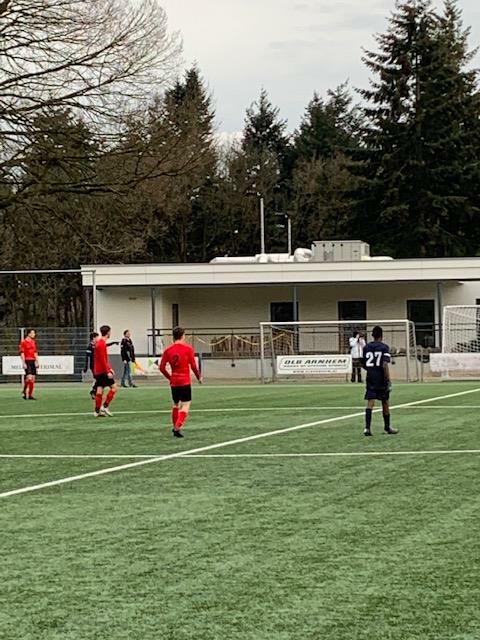 The 02s were up first against a tough FC Brunninghausen side. Unfortunately, there were a few boys who had to sit the game out due to injury. The team had a difficult time finding a good rhythm and didn’t get the result they wanted. 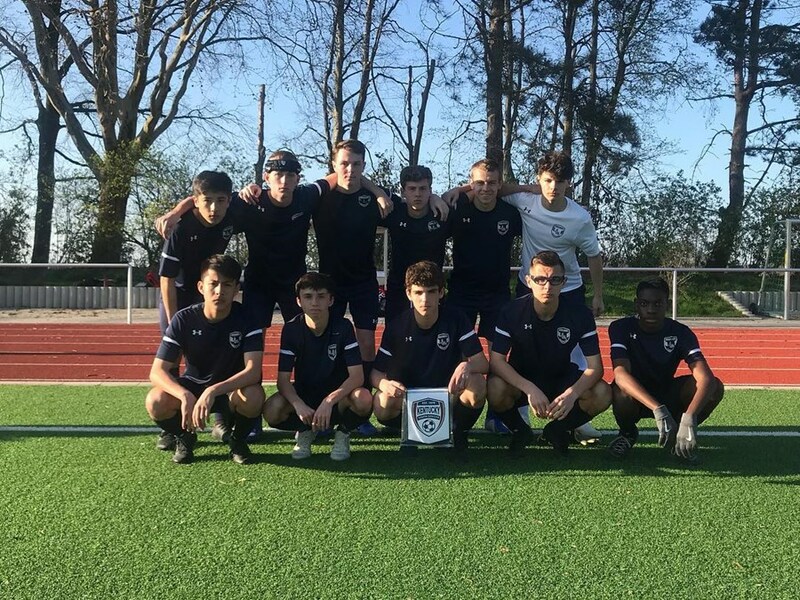 The 2003 Kentucky boys ODP team played their 2nd match on the tour. 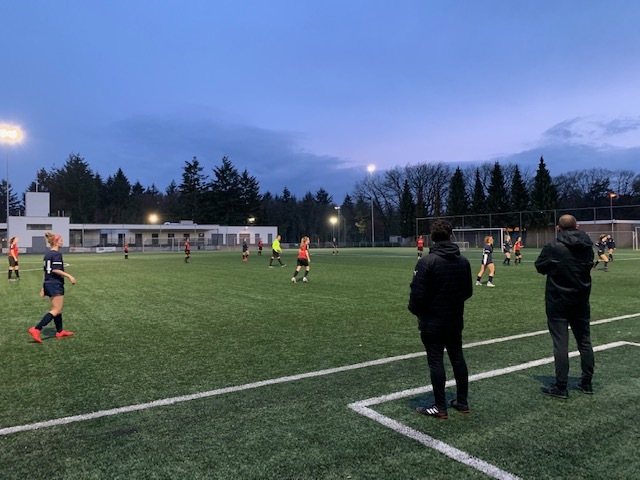 They earned a 1-0 victory against a older 2002 team which competes in the German Landesliga. 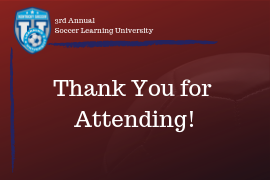 It was an extremely high tempo game with a lot of skillful passing and strong physical challenges for the entire 70 minutes of play. The Kentucky team defended their goal extremely well when under pressure. They created a great number chances to score throughout the game as well. 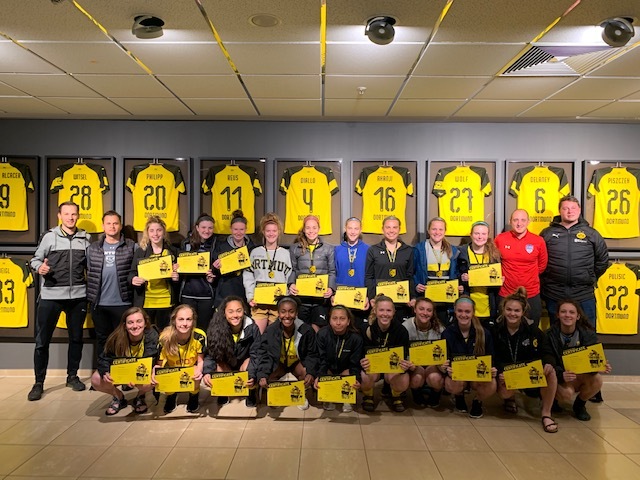 Coach Mike Dickey said, "I have coached a great number of quality players and teams in my career and I rank this particular group of players as one of the best teams I have worked with. Credit goes to the players first and also the coaches back in the USA who have been helping them become the players they are today. 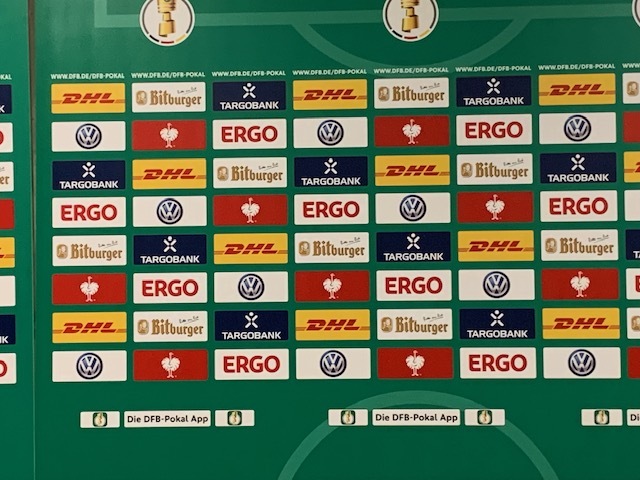 We look forward to our final game tonight in Holland." The day was the worst in terms of weather as it down poured toward the end of the 03 boys’ game. After a long evening of games, we got back to the hotel pretty late after 10 pm and had a late dinner. We got all the kids back to their room and directed them to start getting all of their things put back together and packed with another long day on Wednesday and a 3 am departure to the airport on Thursday morning. 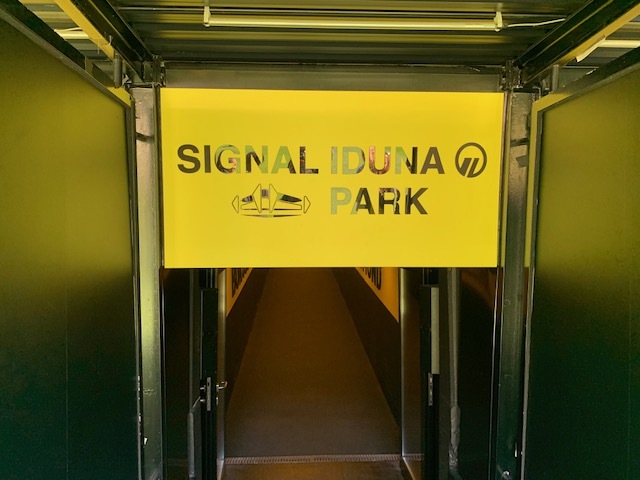 The final day of training at Dortmund was at 10 this morning followed by our final lunch at Signal Iduna Park. We were once again treated to a nice meal with dessert. Patrick, our gracious host with the club, did a short ceremony after lunch. 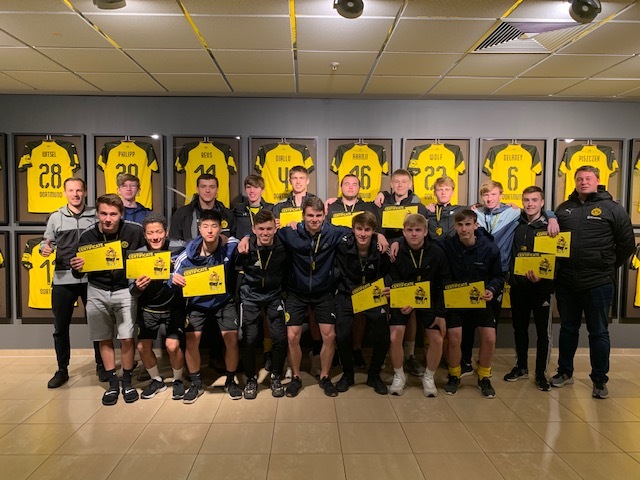 He presented all of the players with a medal and certificate to commemorate their time at Borussia Dortmund. 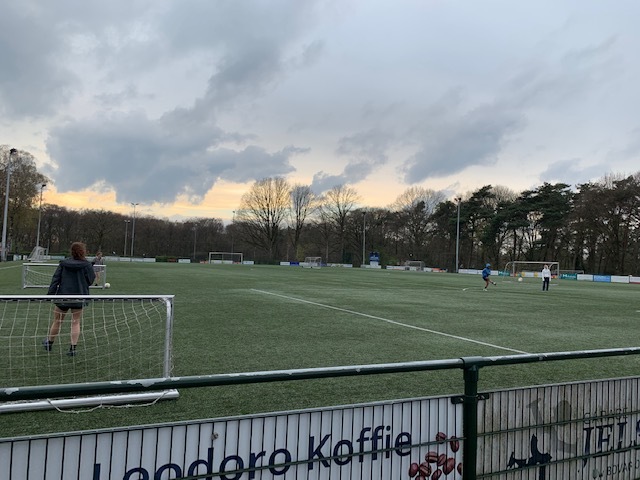 After lunch, everyone went back to the hotel where the girls got started packing up and the boys got their things ready for their game in Holland. 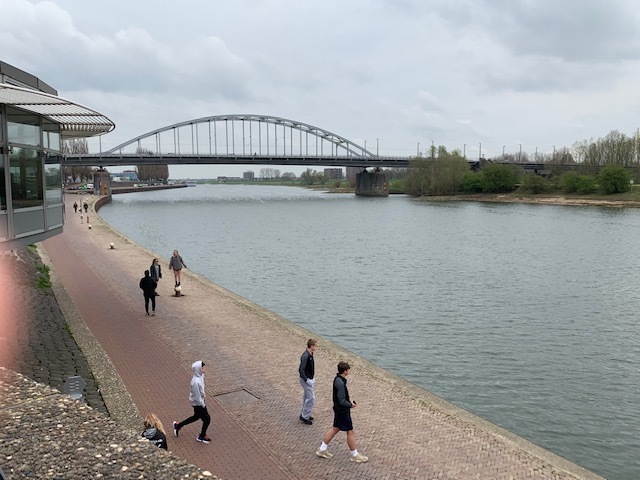 We left for The Netherlands at about 2 pm and headed to Airborne at the Bridge in Arnhem. 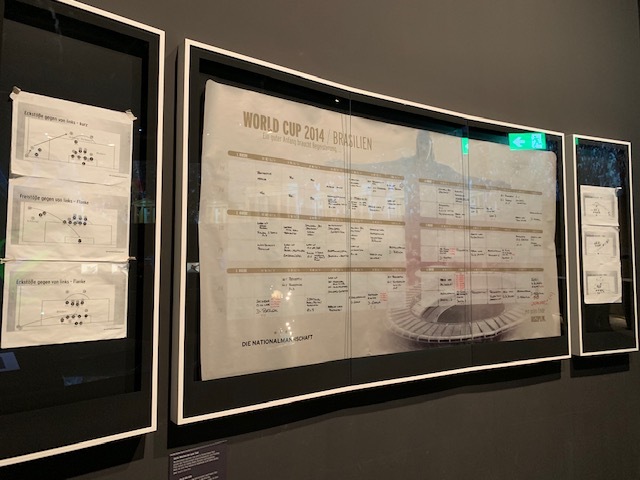 We had the opportunity to hear a little bit about the battle that took place in Arnhem during WWII before our evening games. 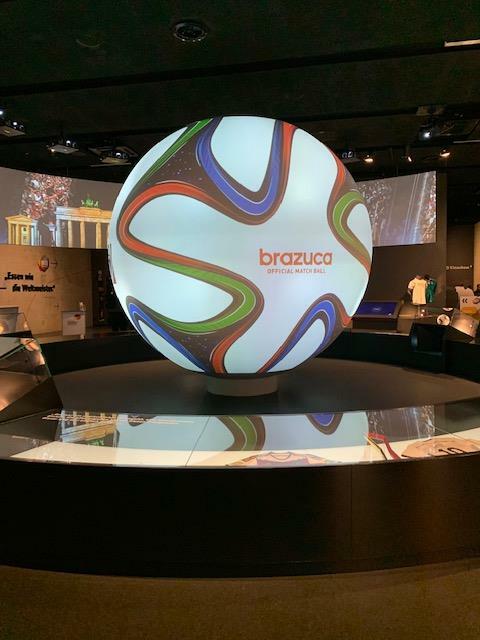 Although a small museum, it was an incredible learning experience for the players. 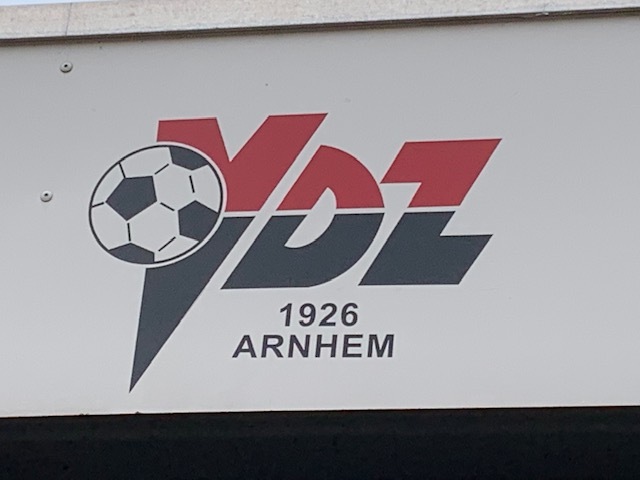 All of the teams played VDZ Arnhem with the 2003 boys kicking off first at 6:30 pm. 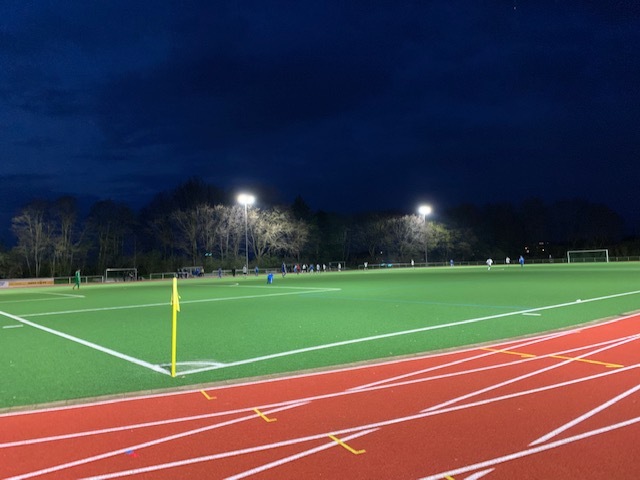 The facility was fairly large with numerous locker rooms, some grass fields, artificial turf fields and a mini pitch. 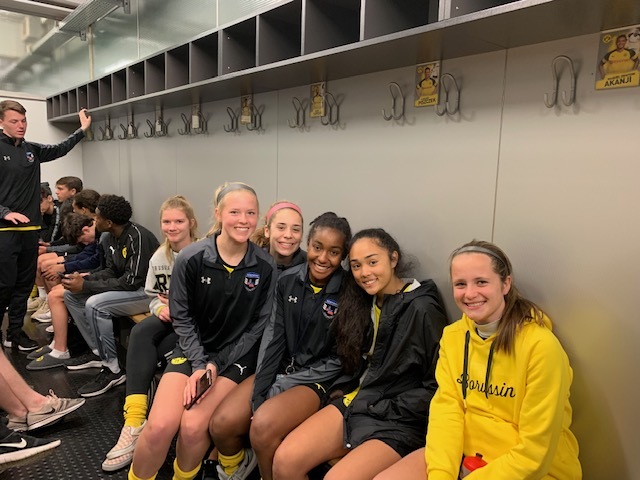 Some of the kids were a bit disappointed that they did not get to wear their soft ground cleats today as they had to play another game on the turf fields. The 2003 team played an intense game that got pretty physical toward the end. They had another successful result and did a great job keeping their cool despite some pretty nasty challenges. 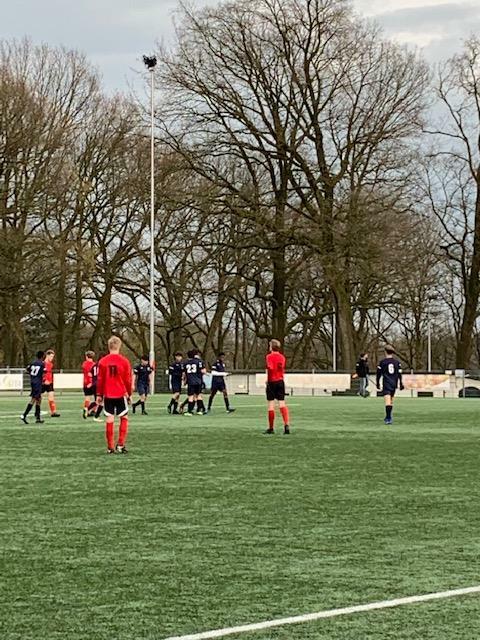 The 2002 boys and the girls kicked off after the 03 boys. Both teams worked really hard and played well against some tough opponents. The games ran a little late tonight with the first one starting late, so we got back to the hotel late - just before midnight. The girls are going to have a late night with a hotel departure of 3 am with the boys will be leaving a little later in the morning. We have all had a great trip but I think mostly everyone is looking forward to going back home! 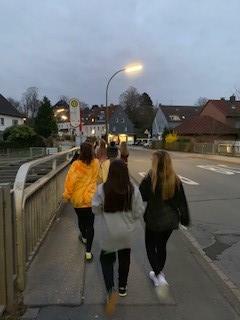 Our final day in Germany started off with the girls departing the hotel from the airport at 3:00 am to get checked in and ready for the flight. 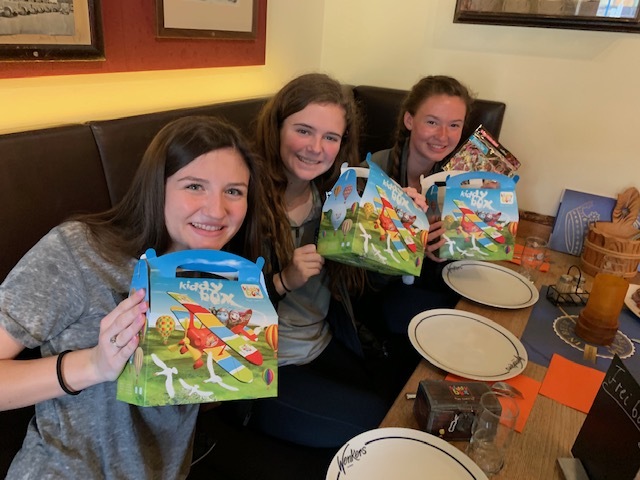 The hotel had some packed meals ready for us to eat on the long drive to Düsseldorf. There wasn’t much time in the airport so most of the group found a Starbucks to either have a quick snack or a quick nap. 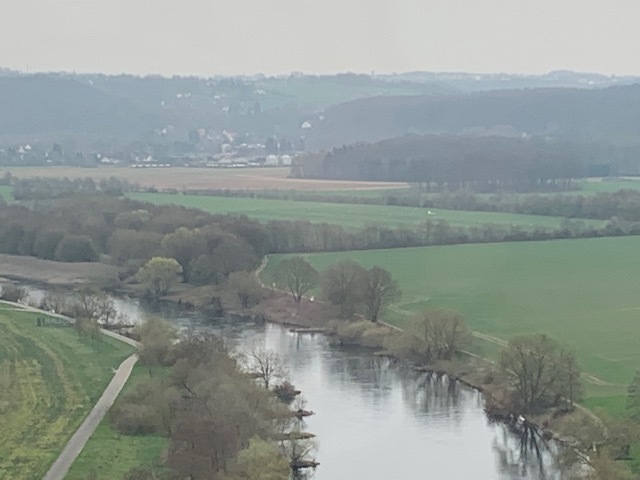 The journey from Düsseldorf to Paris and then onto Cincinnati was pretty smooth. On the boys’ side, they had the opportunity to wake up a little later with a 6 am breakfast at the hotel. Unfortunately, the boys did not have as smooth of a trip back to the U.S. They flew from Düsseldorf to Atlanta then to Louisville. 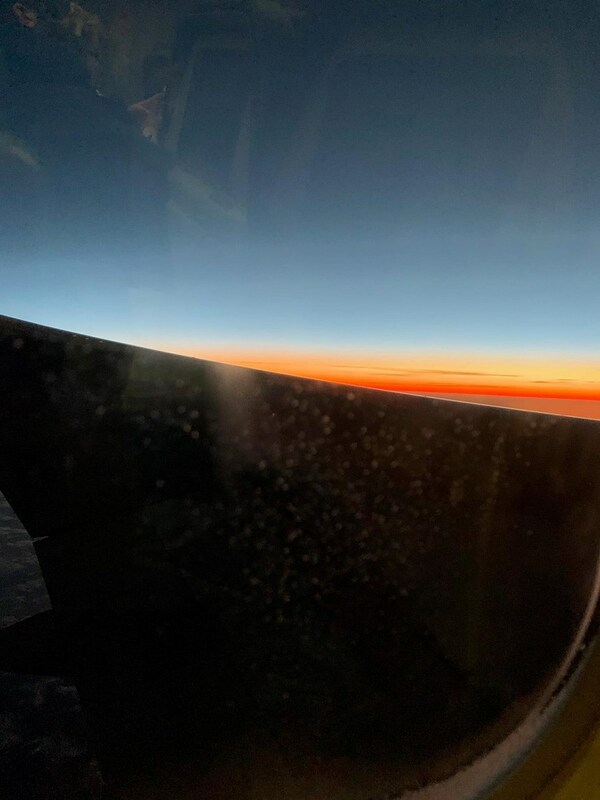 Unfortunately, they had some delays that caused the group to miss their flight out of Atlanta, so the group was rebooked onto three different flights with the last group of kids getting into Louisville at around 12:30 am. 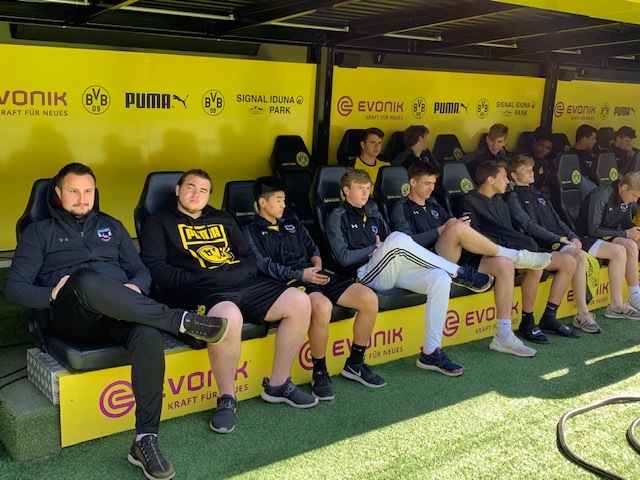 Despite the travel issues for the boys on the last day, this was incredible experience for all of the players who participated. 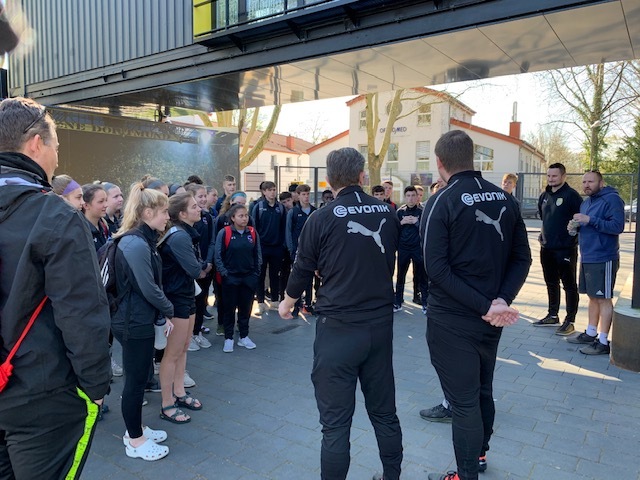 There was so much packed into the trip that it will take some time for the players to unpack all of the cultural experiences, training/playing experiences and lessons learned while training and playing internationally. Everyone really enjoyed their time but are also happy to be back home!